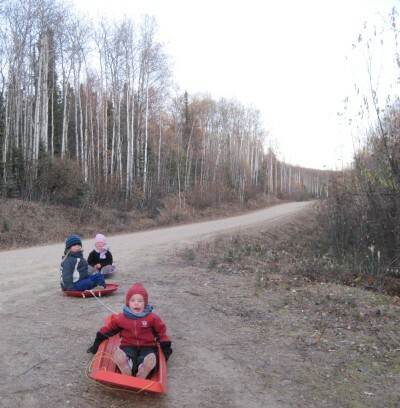 We are going to winter in Fairbanks! 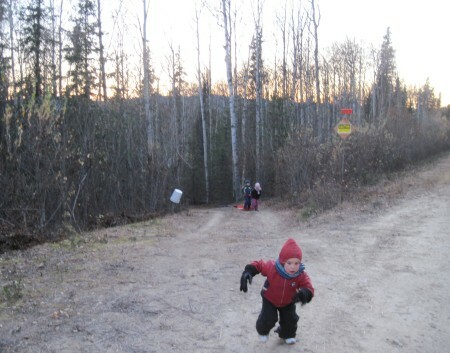 On Friday the 13th we arrived in Fairbanks. On Saturday the 14th we celebrated at the fair and at the Hampton Inn. On Sunday the 15th we hit the ground running! 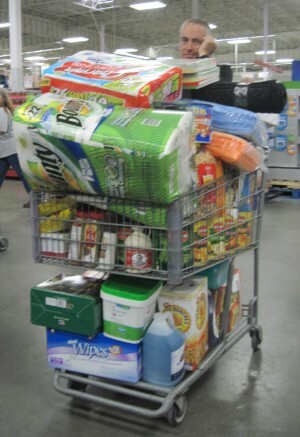 The first cart load full of food and supplies. 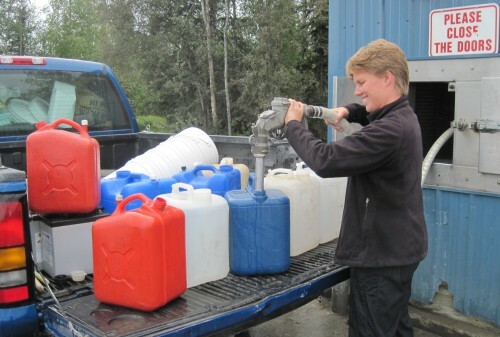 Filling up the water jugs at the water wagon. 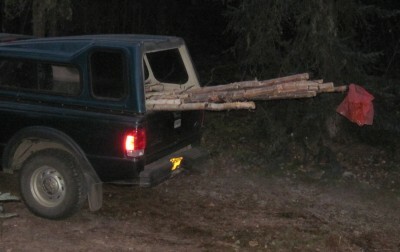 The first load of fire wood for the winter! May there be many more. And we have our new mailing address. Thanks to post lady June! We moved into the cabin on Friday the 20th and are loving it! It looks like we've got the internet somewhat figured out. Now most of the dust is settling, we'll try to update it soon and keep you posted of the first signs of winter and beyond. It's 6am. It is already light outside. 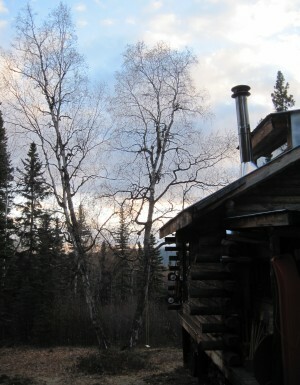 The wood stove is going nicely; slowly heating up our cabin. We've lived here for ten days already. Days filled with hauling and stacking wood, filling the kitchen to the brim with bags of flour, sugar and rice, cans of fruit and vegetables. We're getting ready for winter to set in. Outside the forest is turning more and more yellow every day. It is going fast. Yesterday we saw the first leaves drop. It doesn't only mean that fall is here. It means that winter is knocking on the door. This morning it was 39 degrees. It's a dry cold. So it doesn't really bite. Still, a jacket is nice on the way to the outhouse. 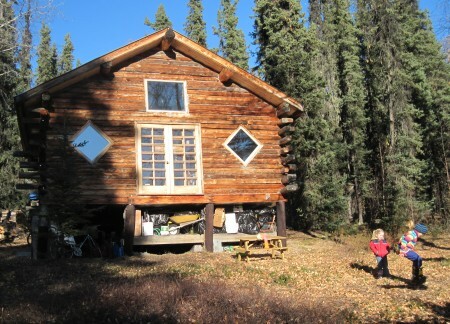 The cabin is lovely situated in the hills north of Fairbanks. We don't have electric or running water. To charge the laptop and phone we've come up with quite a contraption. A solar panel is going to charge two 6V car batteries. To them we hook a couple of converters into which we can plug in. Besides this we have a generator on the porch to cover for the months without sun. 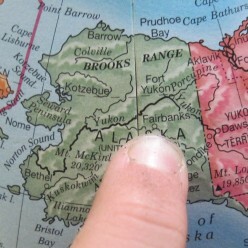 Eventhough we're very high north, we're not that far. We're still south of the Arctic Circle, which means we will still have a couple of daylight hours in December and January. As of now it's light from about 5.30 am till 10pm. But it is dwindling fast. Every evening we turn the propane lights on a little sooner. Inside the cabin it's laid out very simply: coming in you'll find the wood stove to your left, the kitchen to your right. Go a little further and you're in the dining/play area. A little bit more and you're back outside. It's an open floorplan; creating a lot of space. Upstairs, about half of the downstairs 20x24 feet, is a loft. Space for us all to sleep. It's cozy. We'll find out soon it it is still cozy when it's to cold to go outside this winter. 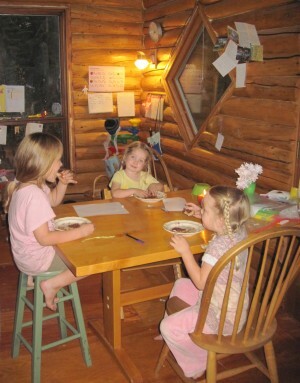 The girls are enjoying life in the cabin. 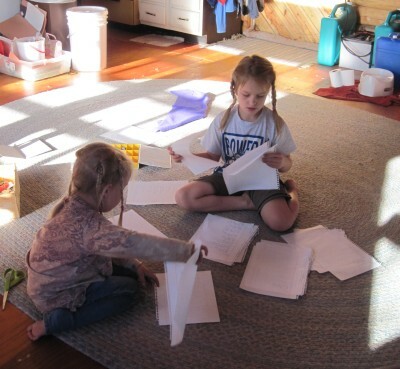 They each have workbooks for math and reading. Even Robin: "Where is my math book mommy?" They're all over them. You've got to love it. We have some art and craft supplies. 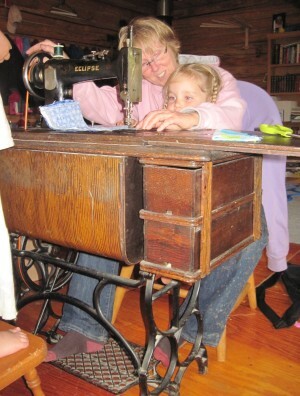 We even have a threadle sewing machine. Cheyenne and Jasmine are already masters at pedaling. Yesterday we made each of them a purse. Pockets included. Robin works on her triangles. 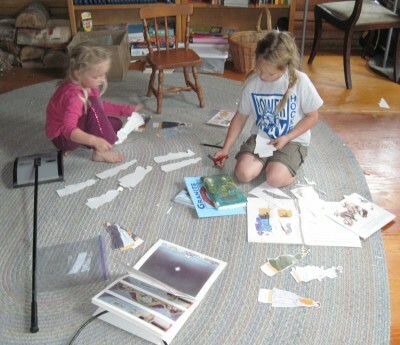 We can always use more craft supplies and (old) workbooks. If you have them laying around and haven't quite figured out what to do with them... Send them to us. We'll need all we can to stay busy this winter! 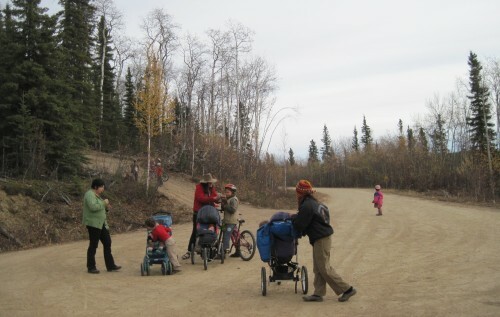 A Pedouin Life on the frontier. What does it entail. The days are still beautiful; warm and sunny with an afternoon shower. We're like squirrels getting ready for winter. Busy running from here to there and back again. Our minds spin of things to be done. Our main concern is keeping the cabin warm. We have a lot of firewood. Birch and spruce. Some cured, some not. The fire starter is of importance too. Fire starter is provided all around us. 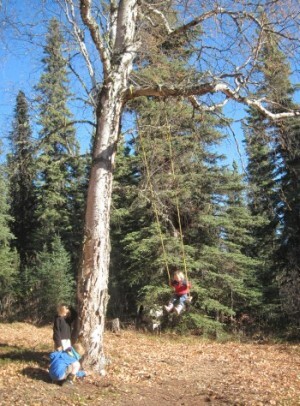 The lower branches of the tall spruce trees are great for that. 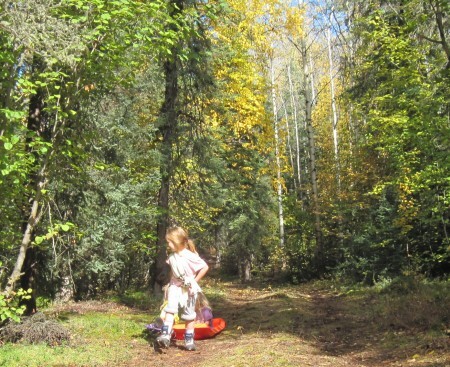 With a sled we walk into the woods, over the inches thick moss paths. 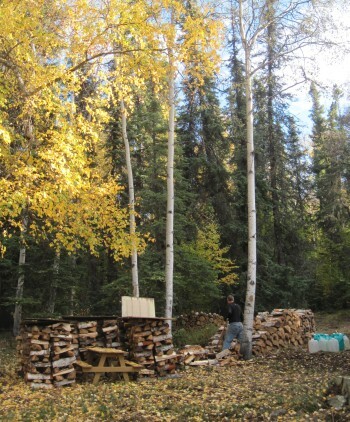 We chop and pick and take several loads to the pile. It's visibly getting taller. Almost as tall as Amarins. How much is enough? Only this winter can tell us. The girls notice the changing colors of the leaves. The wind makes the leaves quiver on their branches. Now and again a flurry of leaves descends from the sky. 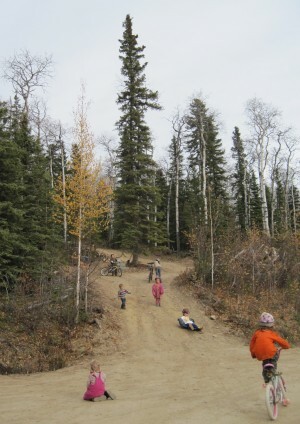 The girls busily help picking branches and pulling the sled. We're hoping to experience some real sled dogs this winter. Jasmine helps pull the sled. Inside the wood stove is going; just to take the chill off the day. Especially nice early in the morning and as soon as the sun sets in the evening. A big rug lies in front of it. The girls are riding a tractor or tricycle over it with great joy. The crayons, markers, workbooks, sticky tape and stapler are in high demand. Cheyenne has a small desk to work on. Jasmine's desk is the sewing machine. Robin has found herself a little cubicle to work on. They're soaking up the new material and are engrossed in the books on the shelves. In the kitchen there is always something cooking. Or baking actually. Amarins is baking up a storm. 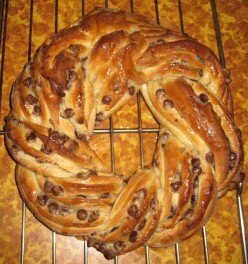 Breads, chocolate wreaths, banana breads, cakes and braided raisin breads roll out of the oven on a regular basis. What a joy (and delight) to bake from scratch. It's certainly more involved, having to do everything by hand, without electricity. But it's a good way to keep some muscles going. Lots of activity in the kitchen. Bill is in Anchorage for the week. He's painting Erin's house. That should make a dent in the bills we've occured since we've arrived here; it's a whole different way to live by the season of winter instead of day by day. We're enjoying the pioneering part of the cabin. 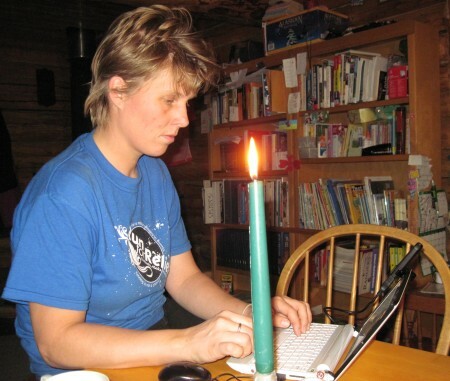 No electricity, no running water, no problem. 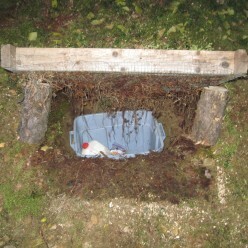 We dug a deep hole in the ground for an outdoor refridgerator. It's a constant 44 degrees in it. Not bad at all. On the porch we have a coolbox. At night we open it up to let the cold air in. During the day we close it. This too works very well. 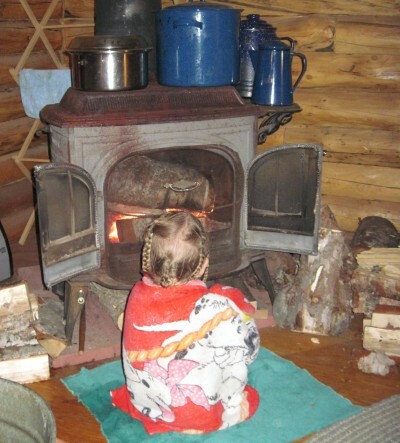 We heat our water on the woodstove. An old steel wash tub goes for a bath. The sink in the kitchen has a straight pipe to the outdoors. Out goes the water. Very simple. Very funtional. Our cabin in the woods. On the property for an entire week. 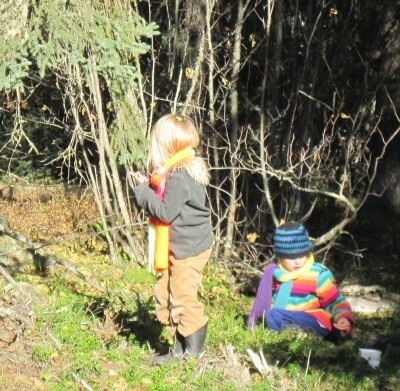 We haven't been anywhere, but to the top of the driveway and into the woods to pick sticks. A month ago we were still traveling on a daily basis. We were content with our life style. Now we are staying put in one spot. And we are content here too. We amaze ourselves with our adaptability. We look at our bicycle in realization that: "Yes, we DID cross the country. 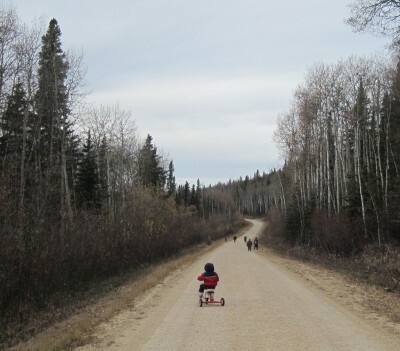 We DID ride that long five person bicycle from Kentucky to Alaska in it's most indirect way." What an incredibly intense and fulfilling way to live. Would we do it again? Absolutely NOT... We've seen the sights on this route. We'd go to China or Europe perhaps. Who knows. Jasmine hoovers over a map of Europe. 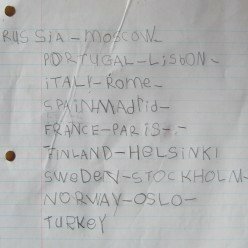 She's finding the countries with their capitals. 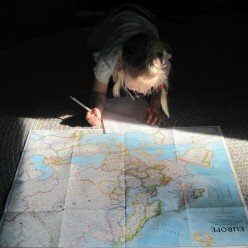 Our love for maps and dreaming into the beyond has certainly been inherited by the girls. Cheyenne finds several maps in an old pile of National Geographics. It's like finding a treasure map. We've found maps for Europe and the United States. 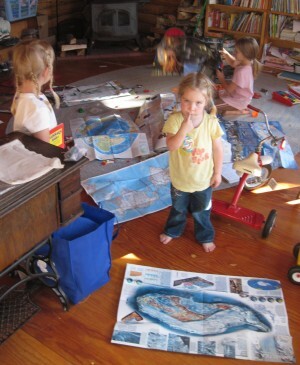 Now we're looking for a world map and all the continents. We want to feed our girls what they're hungry for. An unexpected supper with Cordon Blue and fresh corn with cinnamon sticks for dessert. An unexpected visitor just brought a couple of boxes full of food. From fresh fruit to vegetables, to meat, breads and sodas. An incredible gift. Absolutely enjoyed! Thanks! We're calling the cabin home. But home is missing a member. Our family is not complete without Dogge. Cheyenne has not forgotten him. She's dealt with the loss bravely. We've been there to sooth her in her moments of deep grief. In the wee hours of the night we've been searching the web for another Dogge. An exact copy we haven't been able to find, but we've found one that resembles him closely. This week he's been delivered to our new address on Darling Avenue. Oh the joy. And not just for Cheyenne. Welcome home Dogge! We've finally found a new Dogge for Cheyenne. Very similar to the one she had before it burned in the trailer fire in Cambria. 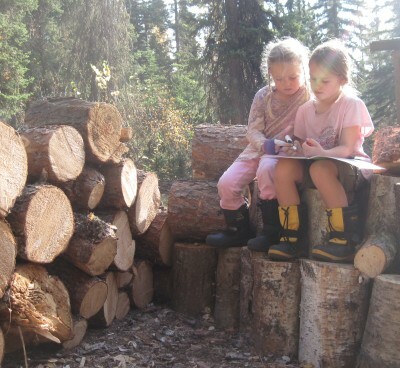 The piles of wood form a good place to play. 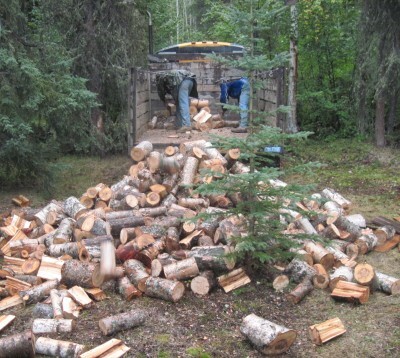 Especially when Amarins builds a ford of the logs around the christmas tree in the front yard. Simple joys of nature. 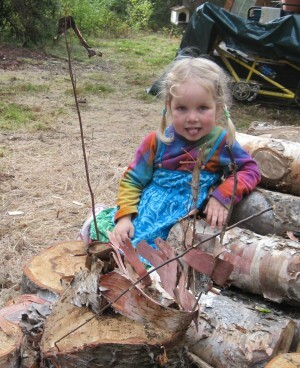 Robin and Amarins enjoy building a little house of bark, sticks and pieces of wood. It even has a slide in it and beds too. It's all a matter of imagination. 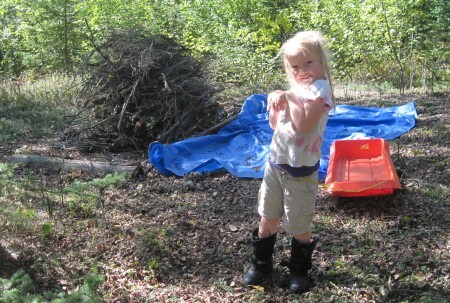 Robin is showing off her stick and bark house. Daylight is arriving later and leaving us sooner. The sun sets over the ridge around 8pm, sending it's last rays of the day through the kitchen window. Still another two hours of twilight before it's truly pitch black outside around 10pm. Tonight it's raining. No stars to admire. We have a star chart ready for when it's dark earlier in the day. Bill is back! 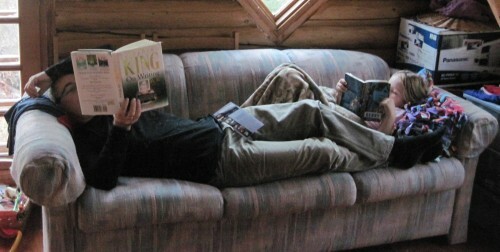 After a week of painting in Anchorage he's made it back to our little cabin. With him he brought our friend Jennie from Trapper Creek (of course it's actually the other way around: she gave him a ride up here). And Jennie brought a globe with her. Super! 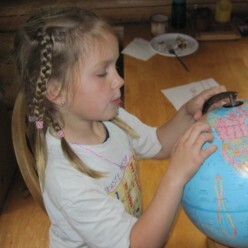 Cheyenne finds Fairbanks on the globe. 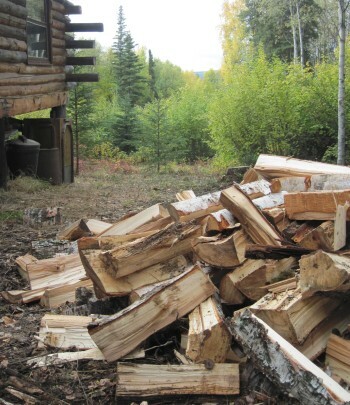 There is still a huge pile of wood to split before winter. Today is a good day to get started on it. Bill splits away. Amarins stacks. In between the girls rake the leaves. 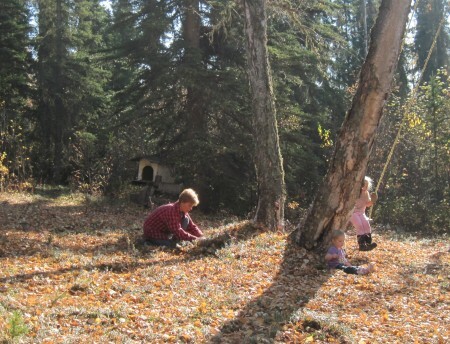 The leaves fall as fast as the girls can rake them. It's a beautiful fall day. Upper 50s in temperature. The sun has burned off the morning fog. Great to be in the great outdoors. Bill works on it all day. About a quart gets chopped away this way. The wood gets stacked up high on the porch. Once that part is full we continue on building pillars in the yard. Stacking it this way will help the air flow around each piece and it will dry out a bit more then when we stack it in the normal way. We're looking at the big pile we have now. We feel good about the winter to come. 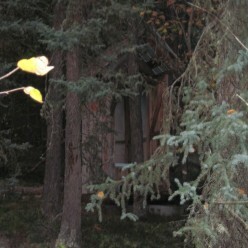 Fall is clearly visible over the split wood. We're enjoying our day in the comfort of our family. We enjoy being together and working together. We also enjoy having new friends come over. And we've made since our arrival in Fairbanks. The warm welcome of the community, the knowledge and advice shared, has done us well. 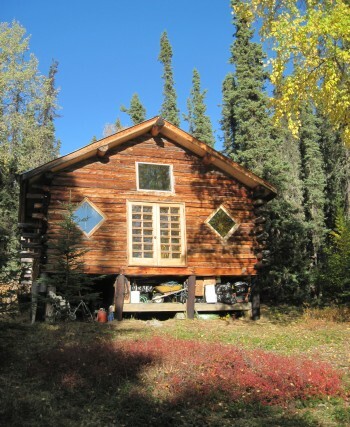 The cabin in fall colors. 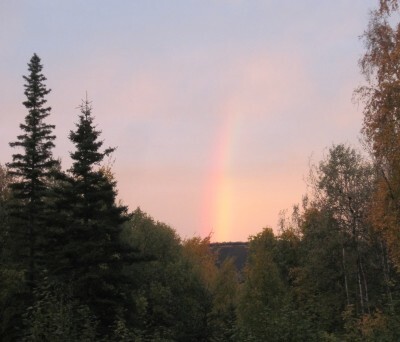 A brilliant rainbow displays itself on the horizon as Amarins walks in the morning light to the outhouse. Two completely different days. Yesterday we wake up to a array of lights we've never seen before. 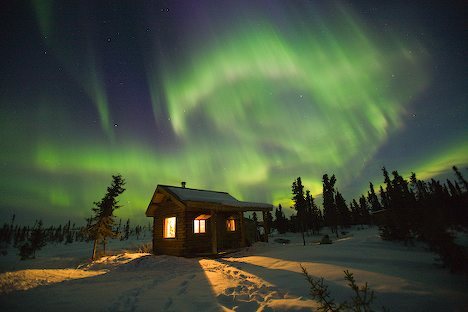 We hear later that the aurora was out (and we missed it). The ligths we see this morning are weird in the sense of deepness. They are so thick yellow-orange-red. You want to reach out your hand and touch it. David and Norma came to pick us up. They volunteered to run errands with us. From the saw shop to the laundromat to the bank and Walmart. When all the running is done we take a break at the McDonalds where the girls enjoy the playground. Next is the library. That was the long awaited promise kept. Computer time at the library. We have time to roam the library and familiarize ourselves with the available books and sections. The girls take to the childrens area. 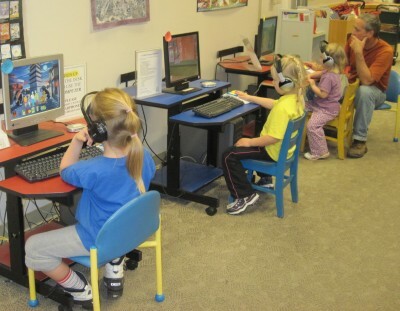 They load up a basket with books, then head to the computers. Even Robin gets a turn to play games. With two bags full we should be content for a while. Especially Cheyenne devours them. 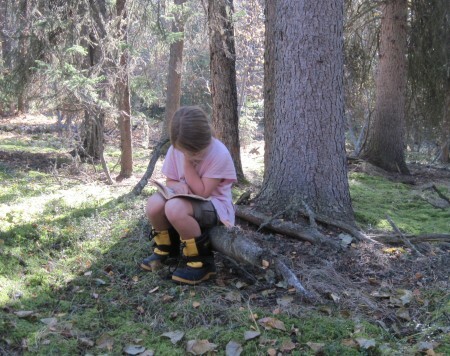 Whether they are picture books or chapter books, they all pass through her hands. In the evening we're invited to the birthday party of Therese; David and Norma's daughter. What a splendid ending to a busy day. Today no lights but rain. Off and on, then harder, then softer. But the rain is there to stay today. Instead of choping wood outside, Bill focuses on enclosing part of the porch. We have some windows we're going to use, to keep it as light as possible. 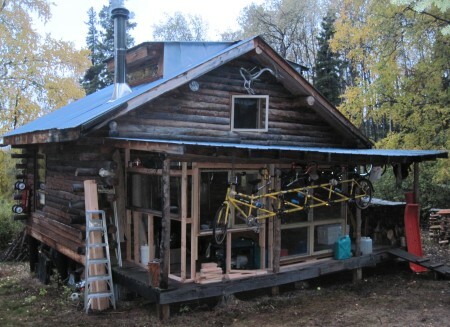 Under the eve of the porch is a perfect spot for our bicycle to hang this winter. The basic shape of the Arctic entry is made, the windows are set. In the next days he'll work on the finishing. The bicycle has found a good spot to hang out for the winter. The enclosing of the porch is a work in progress. Amarins is in the kitchen, baking cookies with Robin. We're quite surprised when they come out the oven. The cookie tray was crooked and made all the dough go to one spot. After cutting the cookies in silly shapes - rectangles, half circle/half square, triangels, etc - we're going for the taste test. Result: yummy! We'll do it again, but then with a more level cookie pan. In the afternoon we're surprised by a visit from Allen. We stayed with him and his family in Anderson. The evening we were there we went cranberry picking. Since we were on the bicycle we couldn't take the cranberries with us, so he's brought them today. Thanks Allen! Amarins is canning high bush cranberries. It's quite a puzzle to figure out what to do with them. The first thought is to just can them as preserves. But that surely is not the solution. The high bush cranberry has one big seed in the center. It would be quite a seedy preserve. Without a colander it's a bit hard to get the seeds out, but with a sieve it turns into quite a good looking jelly. Amarins mixes The leftover of it all with some water and drains it once more. This "extract" should be good as a juice, most likely when mixed with apple juice or so. 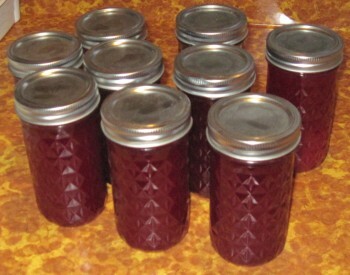 Seven jars of cranberry jelly, two jars of cranberry extract (juicier). Another busy squirrel day! The trees are getting more naked by the minute. Bright blue sky with a brisk wind. The leaves can hold on almost no longer. 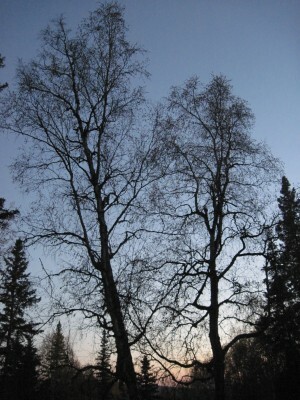 Some of the trees are bare. Some hold on tight. The hill across the valley seems to be on fire in the morning light. The yellows are still on top. The temperature is great. Warming up till the upper 50s. It is a dry air, which makes the temperature feel warm. We're outside in shorts and short sleeves. Can you believe it?! It is hard to believe that in a couple of months we'll be in sub-zero temperatures. 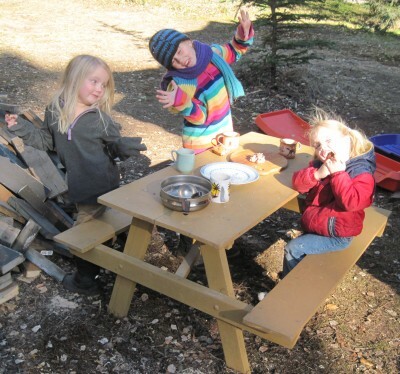 For now we're enjoying the warm air and are getting ready for winter activities. Cheyenne is practising pulling the sled down the drive way. In a couple of weeks we could have snow. Then pulling will no longer be necessary. Bill picked up some supplies yesterday to enclose the porch. Today he's putting them into place. It's starting to look real good. He's used lots of windows, keeping it light and bright. 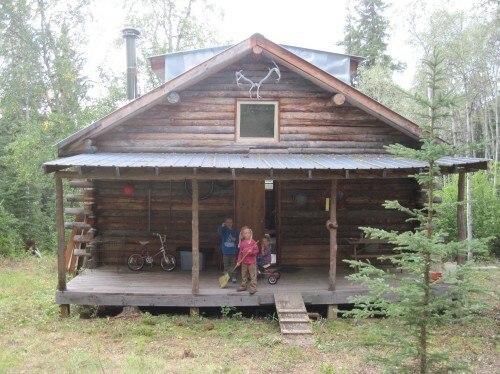 We're going to use the enclosement of the porch as a buffer between the cabin and the great outdoors. We hope it will come in handy for boots and snowpants and parkas. Perhaps a supply of dry wood and a row of water jugs. 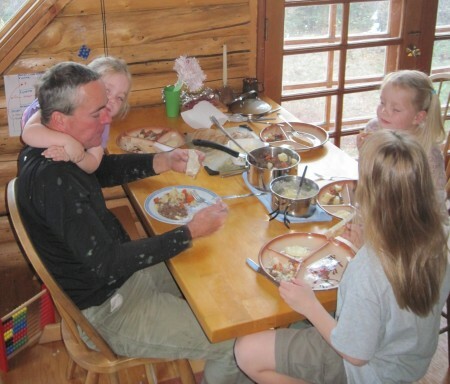 Bill divides his time between splitting wood and working on enclosing the porch. We walk around the yard to see what is new today. The carpet of yellow birch leaves has gotten thicker. 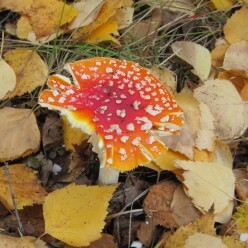 We suddenly find a couple of toadstools, erected between the leaves. The low bush cranberries are getting fatter and fatter. 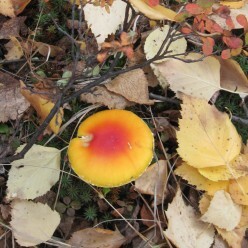 After the first frost we can start collecting them. Right now we only collect their locations. 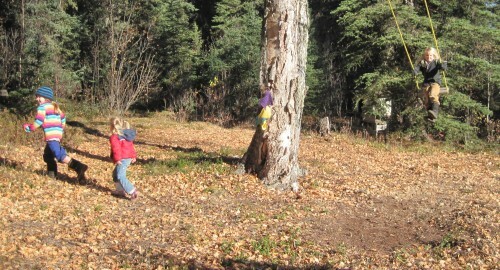 With our eyes focused on the berries we keep finding new patches. Toadstools on an afternoon walk in the back yard. Inside the cabin it's creativity abound. 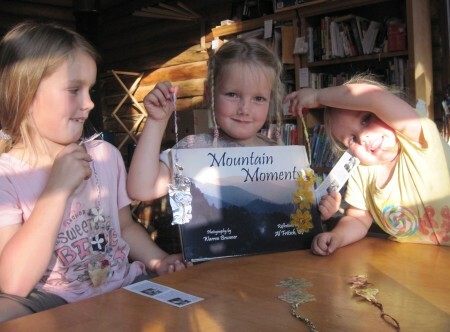 When the girls are not working on their workbooks, they are beading or sowing or coloring. We found a couple of books about how to draw in the library. They've come in very handy. (Even -especially?- for Amarins.) We're learning a lot about how to look at objects and slimming them down to their basic shapes. Shapes all the girls are familiar with. 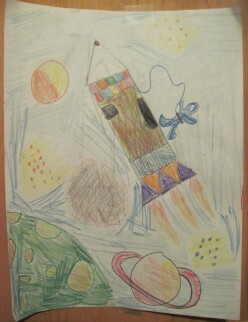 Cheyenne's come up with a terrific idea about what to do with the drawings she makes. Riding out of Alaska in the spring of 2011 in our old schoolbus (still to be found) with our books about the journey (to be written this winter), we're going to stop at hospitals. At the hospitals she's going to give the drawings to the sick children there. What a heart of gold she has! Tonight we light the candle, remember those that were killed in the terrorist attack on twin towers; tomorrow already nine years ago. Where does the time go. And what have we done with it while it was there. 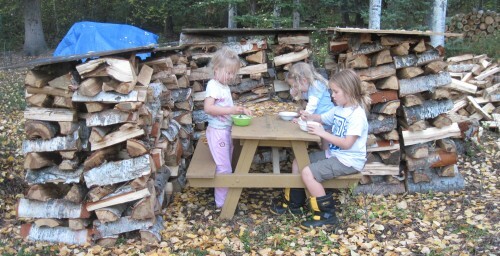 A yogurt dessert between the wood piles. Enjoying the freedom we still have. Goodmorning! We almost had our first frost last night! A clear sky will help these matters. Winter is on its way. There is no doubt about it. 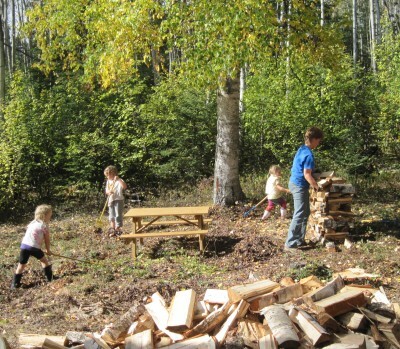 We're thankful we have a good pile of firewood. Part split and stacked. We're also thankful for our friends Lauri and Martin. They're coming to help us cut more firewood today. We have a couple of dead trees we can surely use for firewood. 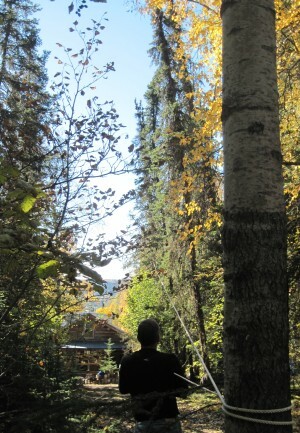 Bill is holding on tight to the rope, making sure the dead tree does not fall on the cabin, as Martin cuts the tree. It landed exactly where the men wanted it. In the road, ready to be cut up. Lauri and the girls can come safely out of the woods now. The coast is clear. As the men disappear in the woods, hunting for more trees to be cut up, the women are stacking the pieces. With a cart we head into the woods too. In the footsteps of the men. We're loading the cart several times with the biggest pieces. The smaller pieces can be picked up by Amarins and the girls later in the week. Martin builds the girls a swing, to give the girls also some fun on this labor filled day. And what a swing it is. It comes down from the highest branch in the backyard. Once you're going, you're going very, very high. Feel the breeze in your hair. Martin tied the girls a swing. High up in the tree. Cheyenne is the first one to try it. And high she goes! In the mean time, a most unpleasant job is going on inside the cabin. We've been having the company of quite a few flies over the past weeks. No matter our effort to get rid of them, they are here to stay. 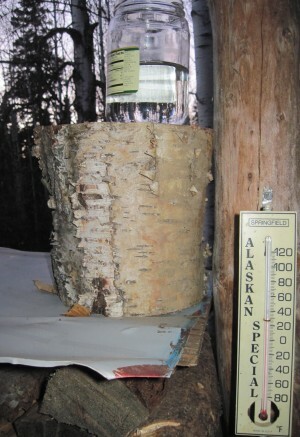 As Lauri and Amarins go on the hunt for the breeding grounds they find out that the insulation between the window sills and the logs is basically a farce. Just a tiny piece to make it look as if it is insulated. Once it's pulled out... Out come the flies... So gross. We don't even attempt to count, but hundreds is probably an understatement. Revenge of the flies. Oh yak! Not only is there just a tiny piece of insulation, there are huge cracks around the windows. You can literally look outside between the logs and the frame. No wonder the flies had made themselves such a comfortable home there. Welcome to the great outdoors. Who says you need to seal the (half inch) cracks around the window? Besides all the above, the chimney has been swept and the porch has been fitted with a styrofoam ceiling, to keep some of the heat in - or perhaps cold out. 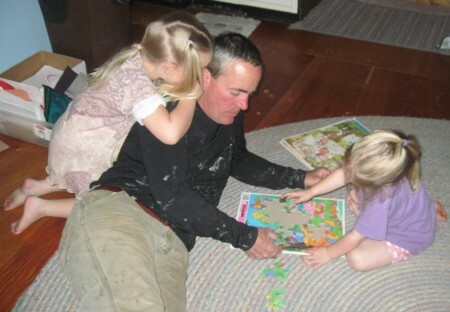 Bill is taking it easy with the girls today. The outdoor swing is a great playground, especially when you're being pulled high in the air by daddy. David and Norma stop by later in the afternoon. They've come to pick us up to go berry picking on Murphy Dome. A chance we're taking with both hands. And how fortunate that we went. We might not have picked a whole lot of berries, but it's been an experience we won't forget easily! 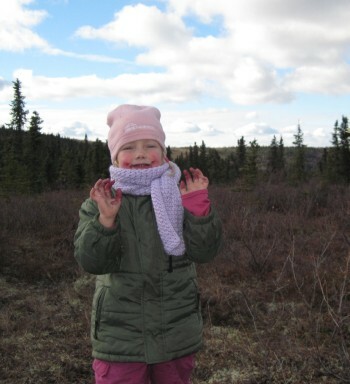 Cheyenne on the tundra; picking blueberries. A fat and juice blueberry is waiting for us. Out on the tundra with Norma. Jasmine has a bucket with buckets. 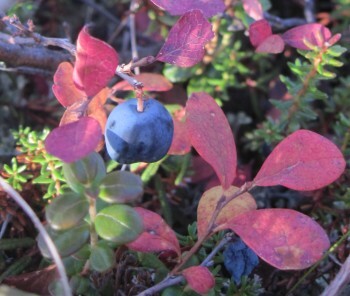 One for blueberries, one for low-bush cranberries and one for crow berries. That is one very big blueberry! As the sun is setting on the horizon, it is time for a cup of hot tea. 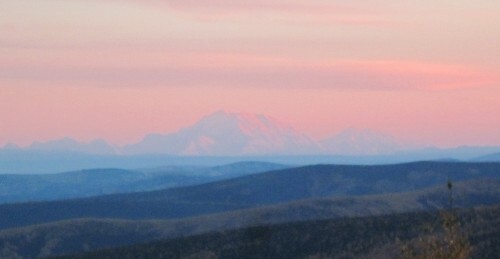 Denali in the alpenglow of the evening sun. 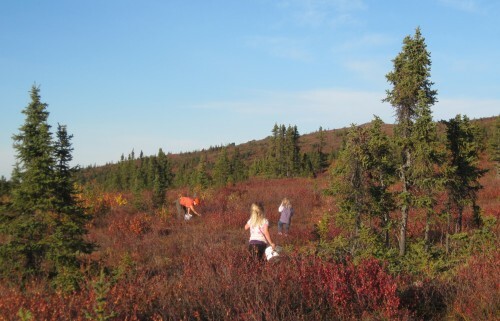 As the girls and Amarins walk the tundra looking for berries, Bill is sealing up all the cracks with spray foam. Let's see what this does to the fly population. We saw the Aurora Borealis last night!!! 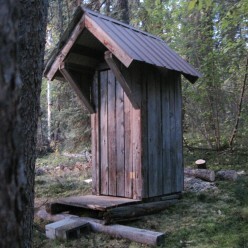 You've got to love walking to the outhouse in the middle of the night! Initially we were taking it in as two strange straight clouds. Standing still we noticed the slightly dancing movement. We gasp when we realize we're seeing The Lights! A hue of green is clear across the sky. Straight above our heads. Dazzling the eye. There she dances, sometimes barely noticeable, sometimes with fingers running up across the sky. They wave from left to right and back again. We can't stop looking at it. "Look there, look there!" We can't catch the lights with the camera. What a magnificent experience it is to see them though. Another set of gorgeous days on the hill. Chilly mornings with sunny skies. The sun sets earlier every evening. We saw the sun in the kitchen window two weeks ago at 8pm. Now it's getting dusky at 7.30pm. 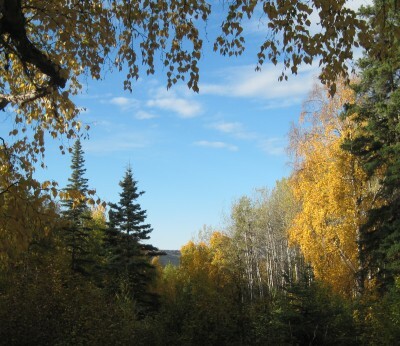 Another week and we're at the fall equinox; halfway to winter. We're thankful that we have these warm days. It gives us the time we need to prepare for the cold to come. Bill keeps on splitting wood. The porch is enclosed and sealed. A big pile of wood is ready on the porch. A bigger pile is awaiting winter in the yard. Stacked high between the trees. The pile of branches has grown till over our heads. And we keep adding on. 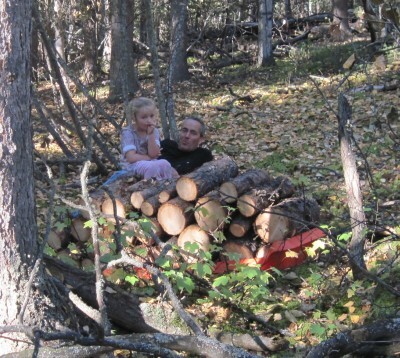 In the woods we still have some logs to pull out from this weekend's splitting. The girls enjoy this weather too. Hammering away. Tick tick tick. Another nail has dissapeared into a log. They're getting really good at hitting the nail on the head. Besides hammering, they're inventing new things on a continuous basis. Today they were working on a water line. Tryingto get water to go from one container to another. No success due to large holes and a cardboard pipeline. Their brains are churning with new ideas. Jasmine and Cheyenne are working on an "invention". They're poring water in one bucket and hope it will go through a pipe to the other bucket. They are having some leaking problems though. Inside the projects continue. 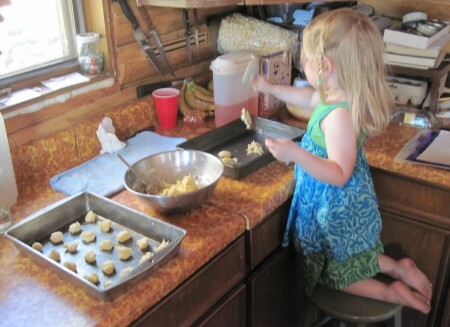 From reading to swinging to helping in the kitchen. The girls take turns helping Amarins. Whether it is with baking cookies, stirring the blueberry jam or doing the dishes. There is always something to do. Baking cookies. Robin puts cookie dough in the pan. 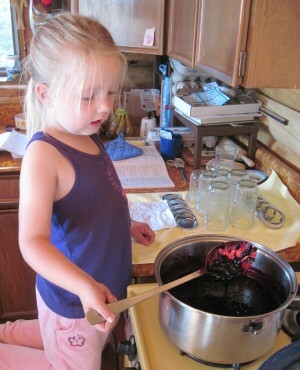 Jasmine is stirring the blueberry jam. When there is no activity in the kitchen, the inside swings are in use, books are beaing read, or the sewing machine is in full use. Jasmine is working and working on new purse designs. With a little help of Amarins she is on her way. Robin is into some deep stuff. Cheyenne is turning her life upside down. When it is time to eat one of us heads for the refridgerator. 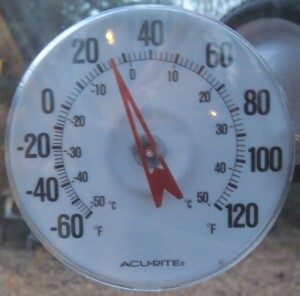 The outdoor refridgerator. It is great to have something so simple work so well. It was a task to dig it, but now we can keep on using it. Effort in, result out. 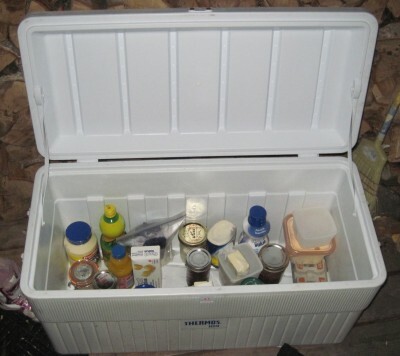 The outdoor refridgerator. Amarins dug a hole as deep as a 30 gallon tupperware box. It stays about 44 degrees in it. A great place for milk, eggs, butter, cheese and other items. A final update on the flies! It looks like we're done with them. No more buzzing, at least not in throngs! We've seen maybe 20 flies in the past two days. When we do, Bill is the fly-buster! Bill is sucking up the last flies. Looks like our mission has been accomplished. 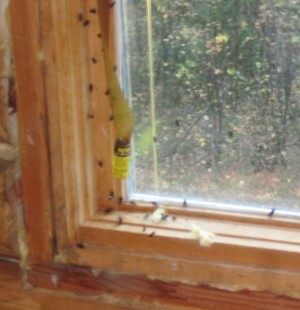 Sealing all the cracks around the windows has certainly stopped the flies from entering the cabin. We feel like we've turned a corner this week. A third of the wood is split, we have plenty of kindling, the cabin is sealed, we've figured out the woodstove, the porch is enclosed. Yes, we can safely say we're ready for winter! Bring it on! The days slip by, the one after the other. We feel relieved that the bulk of the work to get ready for winter is behind us. 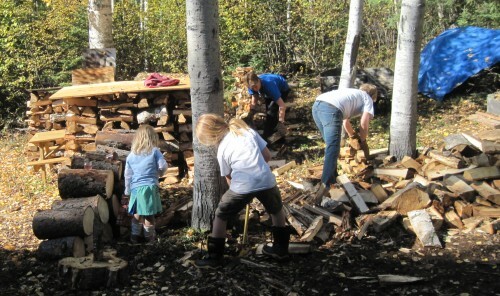 Besides cutting more firewood, there is not much more we can do to get ready. When we wake up in the morning, we stay in bed a little longer, looking at the girls waking up. When Robin wakes up, she immediately looks out the window. "Look, Mommy. Blue sky!" It is wonderful to have children around to point out the obvious. The obvious we forget so quickly, but that are still worth admiring so much. Thanks Robin for sharing the simple pleasures in life with us. 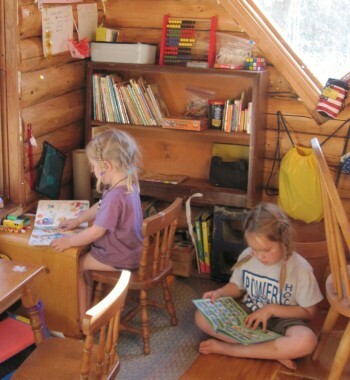 Life in the cabin is simple. The downstairs is about 500 square feet. When it comes to house keeping, it is quickly swept. The windows have had their cleaning. That'll have to do for the winter. And that's all there is to it. You've got to love it! The kitchen is an ongoing project. There is always something going on. We start the day with breakfast of course. Sometimes a home made bread sandwich, sometimes pancakes, lately also hotcakes. Hotcakes are made with a sourdough starter. That's a story by itself. After several failures, Amarins has finally "brewed together" her own sourdough starter! 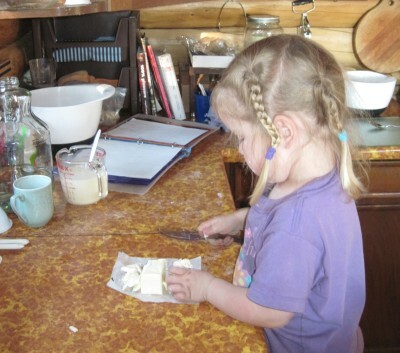 Starting out with milk and yogurt, later adding flour. Give it a week and it resulted into a fine sourdough starter (if she may say so). This young starter is great for hotcakes. When Lauri and Martin came up this weekend they brought a sourdough starter from friends. (They knew about Amarins' trials...) This is the really cool part. 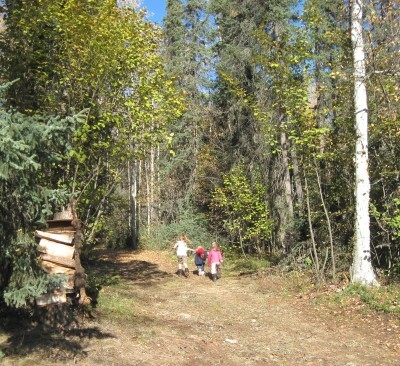 It is a starter that originally traveled to Fairbanks over the Chilkoot Trail. During the gold rush days over a century ago! This starter is great for making bread, as well as hotcakes. And if two starters are not enough, we also have a starter from friend Jennie. This starter is about a year old. Tomorrow we're going to have Jennie's hotcakes. With this selection of sourdoughs we can figure out what works best for what. We have an entire winter to figure that out. Thus the kitcen is pretty much always in upheavel. Also because of the berries we've been picking. 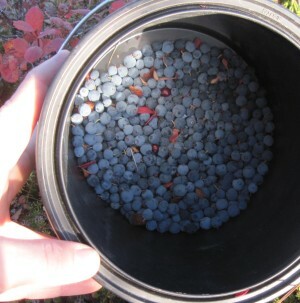 The blueberries have been processed. 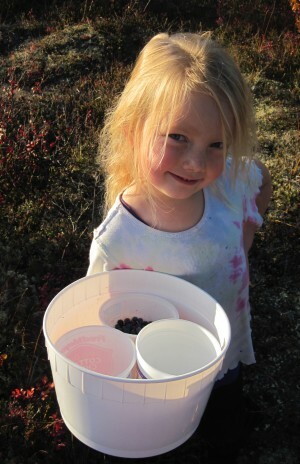 Today we made jelly and juice out of the low-bush cranberries we picked on the tundra at Murphy Dome. Without adding any sugar, it is very, very, very tart. Wohoo. Even with the sugar their distinct tartness is still there. But you just can't over-sugar it to hide its distinctions. It's what makes them special. 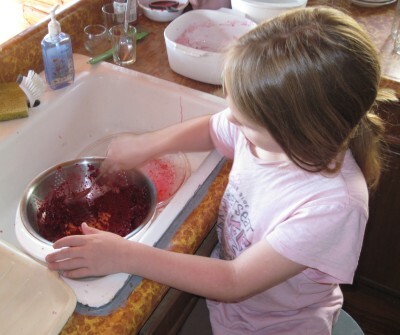 Cheyenne is working the low-bush cranberries through the strainer for cranberry jelly. Under the stairs is the sewing machine. It is in full swing at least once a day. Whether it is to practice making curves and taking corners, or to sew a purse for Jasmine, a cape for Robin, or a jacket for Cheyenne's Dogge. It's a beautiful sight to see Cheyenne and Jasmine take control of the machine. They find it totally normal that their legs are the electricity for the sewing machine. Why would anyone want any different? Robin is also intrigued by it. Pretty soon she'll be pedaling away at it too. 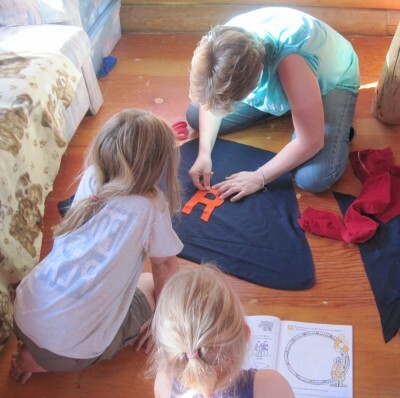 While Robin is taking a nap, Amarins is working on a superhero cape for Robin. It's great having a sewing machine to be creative with. What's even greater is the encouragement of the girls. They don't see any flaws. 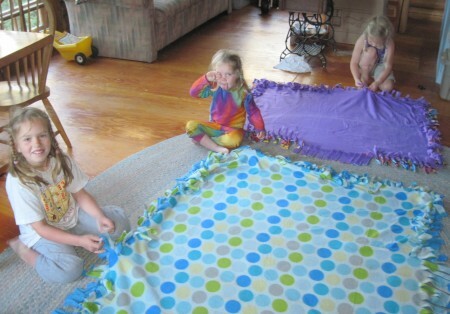 They're totally in awe of the sewing results. 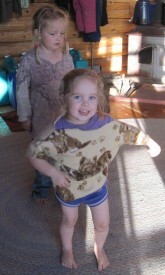 Robin has been asking for a superhero cape for several days. Now it is finally time to make one. Blue for the cape, red for the top, a big "R" in the middle. Let's see what Robin thinks of it. Tada! Here is your cape Robin! Go to the rescue! A new superhero among them, they are off on new adventures. Robin loves the cape, and even takes it up to bed with her. So simple, so much joy. They're off, ready for new adventures. The novelty of having an abundance of reading books and work books around them has not worn off. 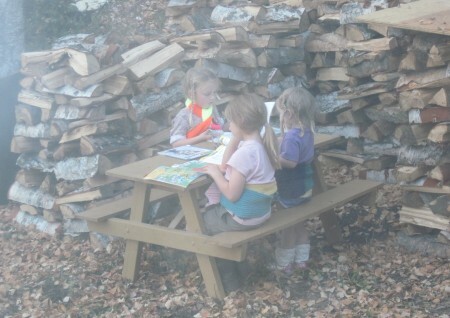 The girls are still eagerly reading and learning. Cheyenne is running through her first grade books. Except for some terminology we've missed during our bicycle journey (especially "homograph"!) she doesn't miss a beat. Her second grade books are ready for her attack. Jasmine is walking through her Kindergarten book. She knows her ABCs very well. We're amazed to hear her sound out the beginning sounds of a word. 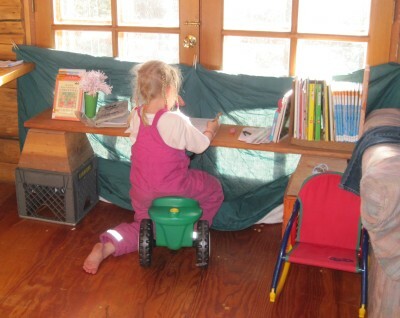 She is so close to reading, we can almost see the magic door opening. Robin of course is not to be left behind. 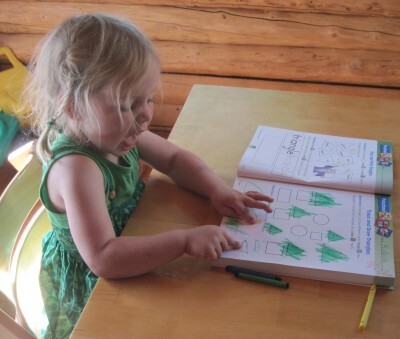 She has her preschool workbooks at her fingertips. They are open before breakfast is served and they don't get put away until bedtime (if they get ut away at all). It is beautiful seeing their eagerness in learning. 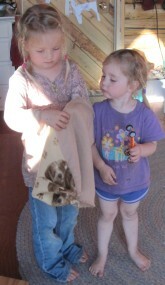 It is close to nine pm when we coax the girls to put away their work and to get ready for bed. 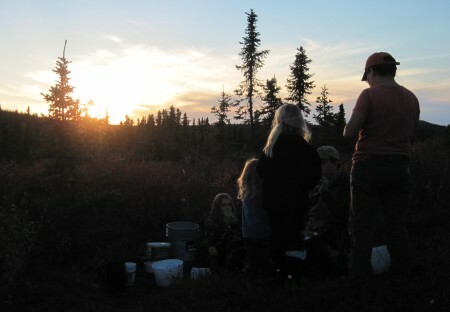 A last trip to the outhouse, a family affair this late in the evening, and up to bed they go. One more story and an other fulfilling day has come to an end. 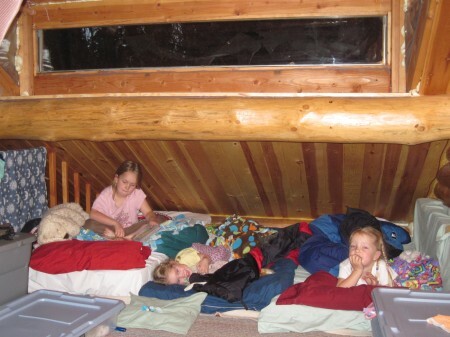 The cozy sleeping place of the girls. Almost as cozy as the tent. When the girls are in bed, there still are three more hours in our day. Amarins is usually up reading. 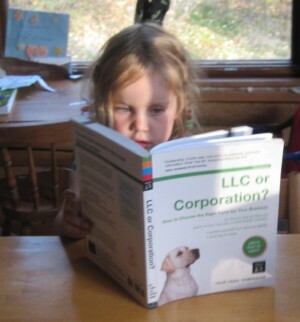 Learning about copyright law, business structures and income taxes. Learning about drawing dogs, mythical figures, heads and cartoons. What would we do without the library! Every other evening it is time to update the website. A nice rhythm has been found in that. 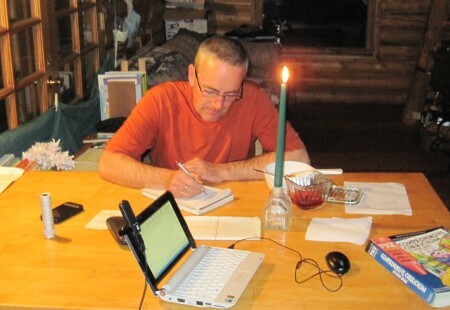 Bill writes in his journal, keeping track of what all has happened around the place, what all still needs to be done. Book chapters are spinning through his head, subjects not to be forgotten. All we need is a table on the porch and he'll be set to start writing. Just like you, we are looking forward to our book too! The evening sky at 9.15 pm. 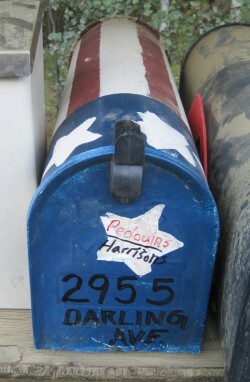 You've got mail! And a bunch of it too. 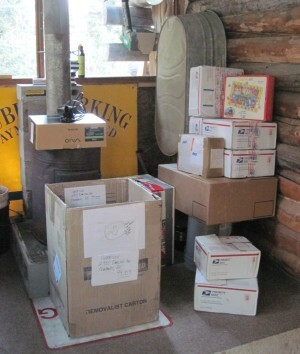 About ten packages awaited Bill at the post office on his errand day. From Georgia to Wisconsin, from Kentucky to California. There is a package from the Netherlands too! We're going to savor the packages. Slowly opening them up, as if we get one every day. The first one to be opened is of course the package from the Netherlands. 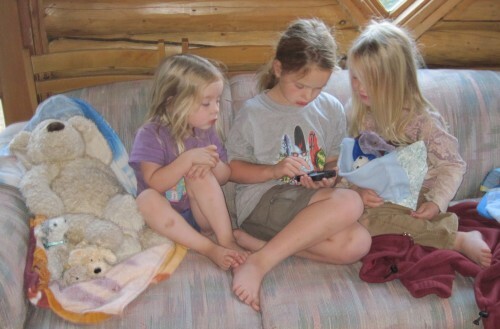 Cheyenne has already read to whom it was addressed: "Cheyenne, Jasmine en Robin". Let's find out what's in it! Scarves for the girls! "Made by Beppe, 2010" it says. What a beautiful gift! Not just scarves, but also little stuffies, also with scarves! And not to forget: "muisjes!" 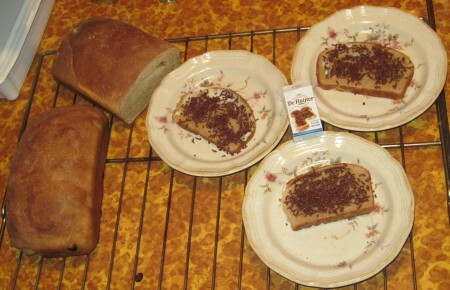 We're out of bread right now, so as soon as we bake some more, we can have this delicious treat. 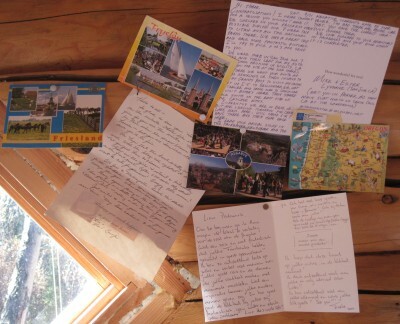 Besides boxes, we also receive cards. From California to Oregon, from the Netherlands to Portugal. We're loving it! Thanks for the congratulations! We hope by the end of the winter we have the entire wall cover with cards! Thanks Pat and Warren for the maps! We now have mas of five of the seven continents! (We're still looking for Asia and Oceania.) And a great variety of other interesting maps too! We can't believe this weather. Sunny, dry and beautiful. Bill keeps on splitting. He finds more and more wood in the forest. We think we have about 5 cords (4 by 4 by 8 foot) all split and stacked. We can probably use another two to four cords to be certain. Bill is swinging it! Over four quarts split and stacked! We've found Bill deep in the woods. With the sled loaded with firewood from dead trees. The girls are running in and out. They love being where we are. We've lived so close together this past year, and we're still enjoying being together! We're so busy getting ready for winter, you'd think we'd forgotten about our incredible bicycle journey across the USA! But to the contrary! An experience we'll never forget! The cranberries are ripe. 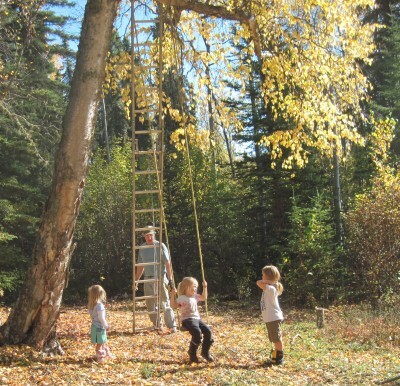 While the girls are taking turns swinging, it's a good time to pick them. Later we'll bake a sourdough cranberry bread. A close encounter with the low-bush cranberries. A book is never far from Cheyenne's eager eyes. Working on the multiplication tables together. Amarins is in and out of the house. Making bread is an elongated project. It's split up in several times of working and waiting. The trick is not to forget what part you're working on. Or not to forget that something is baking in the oven. It is a very rewarding process. The bread tastes a thousand times better then the store bought stuff that you can wad up into a ball. Yuk. No, just give us the homecooked meals and the homemade bread. We like it that way. More work and more reward. 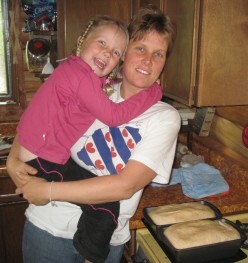 Fresh baked bread with the original muisjes from the Netherlands! Never to late for muisjes! A special thanks to Lauri for letting us borrow her treadle sewing machine and for having the patience to teach the girls how to sew. We're having a great time with it. It is a great feeling to figure out how to make something. Tonight Amarins made a miniature backpack for a tiny teddy bear to be carried by another teddy bear. Robin loves it! 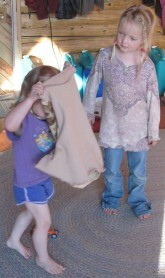 Lauri teaches Jasmine the basics in sewing. 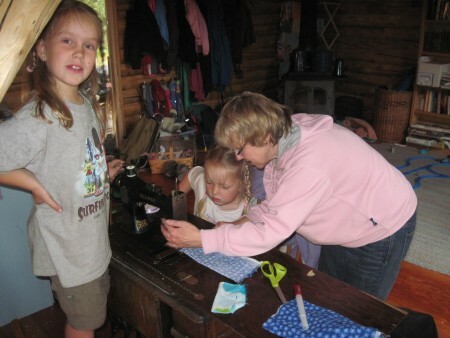 Lauri helps Robin on the sewing machine. The moon is rising slowly over the horizon. It's almost touching it. With clear skies we'll see a lot of the moon this winter. Especially after the first snow. What a reflection we'll be having. In the 1990s the first snow was recorded several times in September. It is hard to believe that's going to happen this year. Another beautiful evening sky. 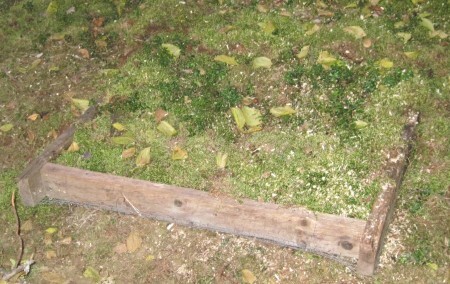 The leaves are gone. Perhaps only some crumpled ones left in the tree. Just a couple of weeks ago they were still fresh and green. It is chillier. The temperature hasn't changed much, but we can see it in the sky and feel it in the air. The blue sky is more a whiter blue lately, it feels more like winter. There is a bit of a breeze going, just enough to give you a chill down your spine. Perhaps we need to start wearing long sleeves when we go outside. The temperature is at its lowest so far! 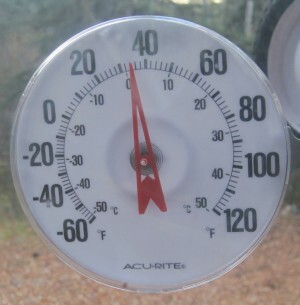 35 degrees Fahrenheit. After an easy indoor morning it is time to go outdoors. Wrapped in their new skarves the girls walk out the door. Snowboots on. They love it when one of us is outside too. It usually means someone is around to push them high on the swing. "Higher Dad!" "Higher Mom!" "All right, as long as you hold on tight!" The freedom of swinging. The wind in your hair, the wiggling in your tummy. And if you're not pushed, then it's a fantastic workout all by itself! The evening comes sooner, we can tell. We've probably lost an hour on each side of the night since we've moved in here a month(!!!) ago. Tomorrow is the fall equinox (for our convenience we always have the equinoxes (equinoxen?) and solstices on the 21th; you've got to draw the line somewhere). The equinox is the time when the sun crosses the equator, making night and day of equal length in all parts of the earth. Thus anyone living on a lower latitude from us (we're on 66 degrees north of the equator), which is almost everyone, will have longer daylight in comparison to us during the winter months. Just before bedtime. Outside they are, workbooks and all. 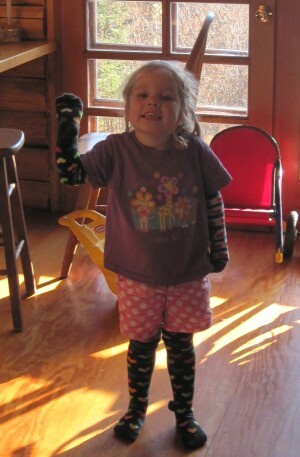 Scarves and snowboots, shorts and short-sleeves. The scarves do great as headwraps. This morning a different scene was found on the couch. 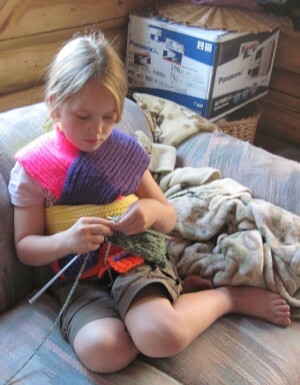 Cheyenne knitting away. A newly acquired skill. Just introduces yesterday. Fiercely picked up with the encouragement of the beautiful scarves from Beppe. What a skill to pick up at such a young age. Every skill picked up is a brick in the wall of confidence. Knitting and scarves fresh on her mind; Cheyenne starts the day with knitting. It's going to be a scarf for Beppe. When we're all up and about Bill pulls out a special book that was send to us from Kentucky. "Mountain Moments is a compelling tribute by photographer Warren Brunner to the people of Appalachia." If you want to see more about the part of the country that we call our home, but are not able to get to it in person, this book is certainly a great way to experience it! (ISBN 978-1-935001-42-3) Thanks for sharing this copy with us Warren and Pat! Reminiscing about our life in Appalachia. The gorgeous, stunning and detailed pictures bring back good memories. We're living the dream. That's a certainty. Be it here or there. Living in the now as much as we can. It's a good life. We're glad you're sharing it with us. We're freezing! It was 28 degrees this morning. And brisk too. The trees were swaying as we've never seen them before. We haven't felt much wind here before. The woodstove held its heat well, keeping the downstairs in the upper 60s for the night. As soon as we let the air flow through the stove it picks back up and sends out more heat. 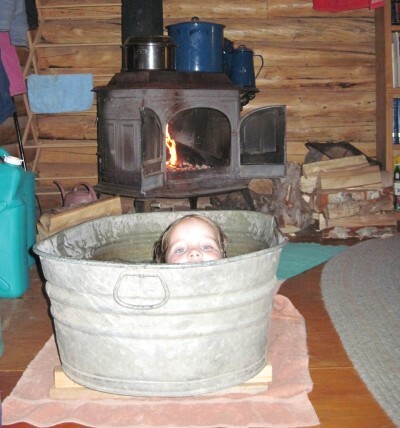 We're so glad the wood stove is working well. Candle light in the morning. It's a little after 7a.m. Light is starting to crawl over the horizon. 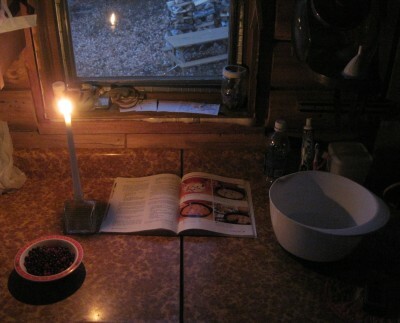 Not yet enough to lighten up the kitchen (which window is on the north-north-west side of the cabin). A candle does just fine to make a cranberry bread for breakfast. Amarins picked the berries late last night, straight from the back yard. Talk about fresh! When the girls get up, the scent of fresh baked bread is hanging in the air. What a pleasant smell. It triggers the belly, jelling "Breakfast is ready!" Breakfast time is family time. This morning we have breakfast time without Bill. He's in town, working odd jobs and running errands. We're taking advantage of the good weather while we can. After breakfast the toys get pulled out. One after the other. 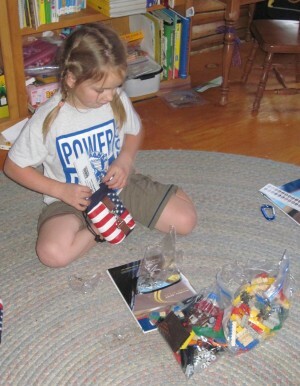 A box of legos for boat building, puzzles and card games. Cheyenne and Jasmine are steadily working on their scarves; with a little help from Amarins they've done about eight inches already. 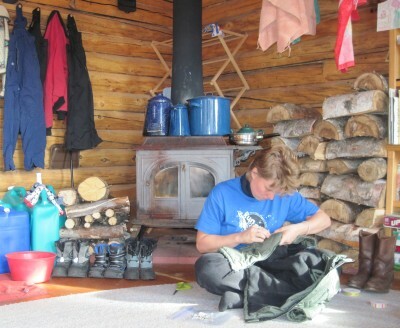 Yep, Beppe's scarves should be ready before the winter in Alaska ends... Robin also thinks she's going to knit. She's rather frustrated when mommy tells her she just can't do it yet. Perhaps we should just get her started on it. Who are we to decide what they can and can't do? One to remember for another day. It stays so cool during the day that there is no need to close the coolbox. It's probably better to open it up during the day now instead of during the night. Who knows what the temperature is going to drop to tonight! We're actually excited to find out. 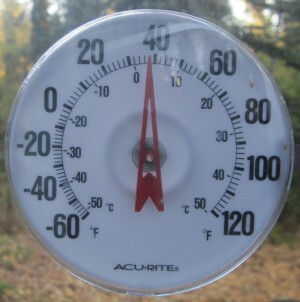 It sure is fun looking at the thermometer from the inside, where it is warm and cozy. Open during the day. Filled with milk products, eggs, sourdough starter, yeast, jam and other things. 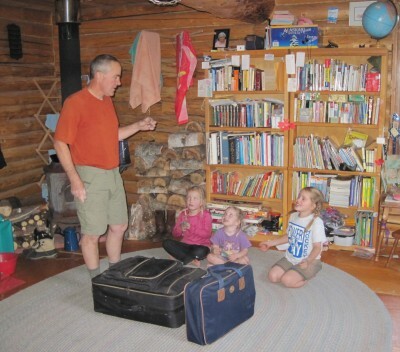 As soon as Bill is back, the girls swarm around him, barely letting him come in the door. Talk will have to wait till tonight. The girls need their share of attention first. That's not always easy to deal with, but we're doing our best. Amarins has outdone herself when it comes to supper. A fresh baked French loaf, home made garlic butter and a cheese sauce, and a beef stew to go with it all. Delicious. We're savoring the flavors and are enjoying the round the table time. We're happy in our family. We're happy with our family. We're happy with our friends - old and new. Wherever you all are on the planet. We love you all. We're thankful that you're with us on this part of our journey through life. It's 8.15p.m. It's already in the lower 30s. Let's see if this glass with water will freeze tonight. 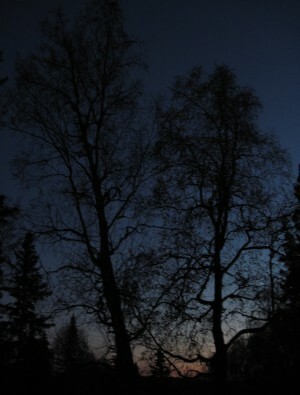 As the dusk fills up the sky, the full moon climbs over the horizon, ready to spread it's glow over the country tonight. The sky is clear, the stars are out. it is 11pm as of this writing and the temperature is at 28 degrees. Exactly where we started this morning. We're sleeping under the glow of the full moon. 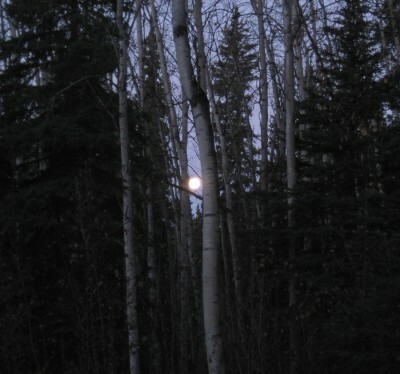 As we slowly wake up in the morning, the moon is setting on the western horizon. We can still see its glow between the trees before the sun takes over. Full moon over the western horizon. Our first thing we do after getting up is checking the temperature. "Was it colder last night then the night before?" Yes! We set a new record low! Twenty two degrees and counting! Down that is. It has been windy for several days and nights. That certainly helps drop the temperature. Something must be blowing in. But what? The winter that's for sure, snow perhaps? Wouldn't that be something! The proof in the picture. Jasmine is making a dictionary for Robin. She picks the words out of the big and bulky dictionary. She's great at copying words. "Abacus, Abutment, Accordion, Add, Adjutant, Agouti, Airmail, Axiom" and on and on. It is a pleasure to see her work. Cheyenne is working on a word-placement puzzle; figuring out how the words fit in the maze. 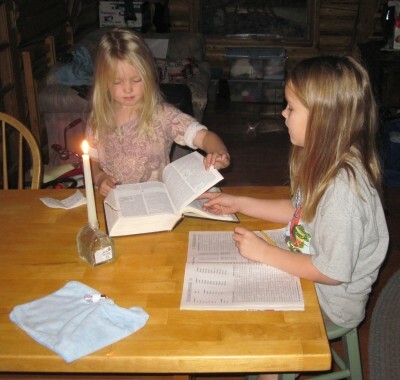 Jasmine and Cheyenne; enjoying the candle light. The girls never seem to get bored. There are many things for them to enjoy. From books to coloring, from toys to sewing. Some days they only work on one thing, some days they pull out everything they can. We also have the outdoors. 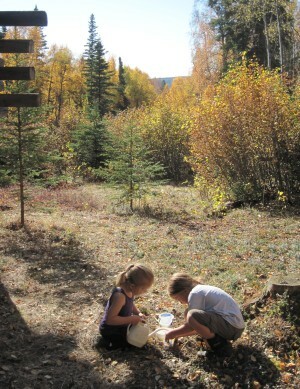 Later in the afternoon it seems to be the warmest and best time to go out and play. The swing is a favorite. So are the sleds. Eventhough there is no snow yet, we're already using them going down the drive way. This tells you something about the steepness of the driveway. Of course the sleds don't slide off the drive by them selves, that's where Amarins comes in. She's the dedicated "sled dog". 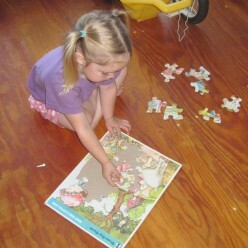 Robin is getting realy good at doing these big puzzles. 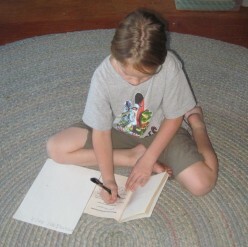 Cheyenne is making a list of the "Magic Tree House" books she doesn't have yet. 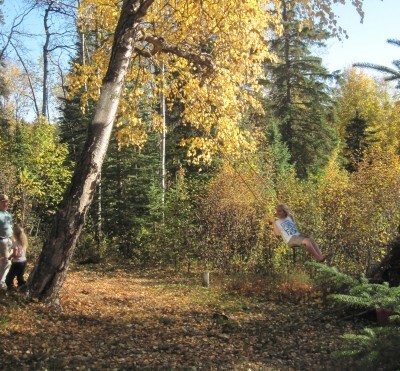 An abundance in outdoor activities. Ready for sledding. Now all they need is the "sled dog". First a mug of hot chocolate and a piece of cranberry bread. Next comes the warming up on the swing. The cabin has its first shadows cast on it. It is 16:45 pm. 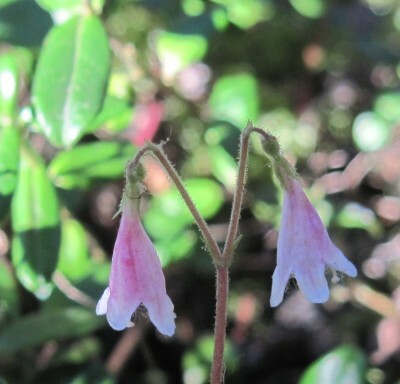 We've found the flowers near our in-ground refrigerator! The last flowers of the season we're sure. They are not bigger then the nail on your pinky. We looked and ooh-ed and aah-ed for at least ten minutes over them. What a find. On the way to the top of the drive way we're picking the low-bush cranberries. They taste delicious in the bread. The night keeps bringing frost. Almost a week now. As far as we can tell it'll be here to stay until the (Alaskan) spring arrives. The second morning after putting the jar outside. It is frozen solid. Bill has been working in town another day. Yesterday he came home with a new phone. It's an I-Phone. We've finally succumbed. This way he can read the email and reply on the I-Phone. The internet connection for the computer works for updating the website, as long as we have the antenna pointed exactly in the right direction. Amarins updates the website like usual. Most of the work - the typing and the picture cropping - can be done off line. For the updating the dial-up connection we have works out. The girls gravitate to the phone. Pressing buttons left and right. Writing letters in the notepad. Even Robin is getting real handy with it. At times even a bit to handy... We hope by letting them play with it that the novelty will soon wear off. For breakfast we have Pedouin Hotcakes! Made with the Pedouin starter. They disappear in rapid tempo. Only one remains on the plate. That'll be a good lunch for Robin, before she goes upstairs and takes a nap. Robin is great at taking naps. She'll resist at first, but knowing that Mommy won't give in, she quickly gives in. Her hands filled with her binkies and several books, she marches off upstairs. For naps she gets to sleep in the big bed. It doesn't take long and she's asleep. 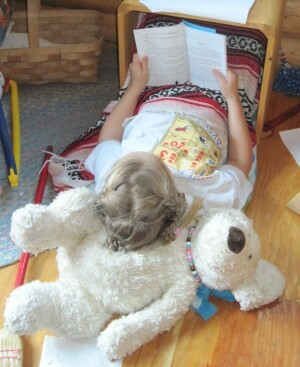 Sometimes we can hear her snore softly, while we are downstairs having quiet time with books and crafts. After Robin wakes up from her nap we have a snack and drink and are out the door. Today Robin is out the door so quickly, she's totally forgotten to dress. 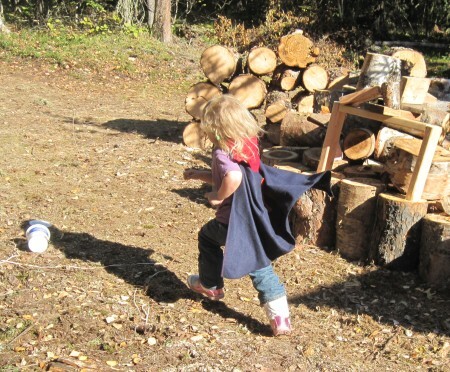 Just a pair of shorts and a t-shirt, she plops her feet in her snow boots and runs to the swing. When she's finally properly dressed - she does admit that it is rather cold (with a windy mid-thirties that is certainly true) - it is time to start swinging. After swinging it is time for another trip up the drive way. 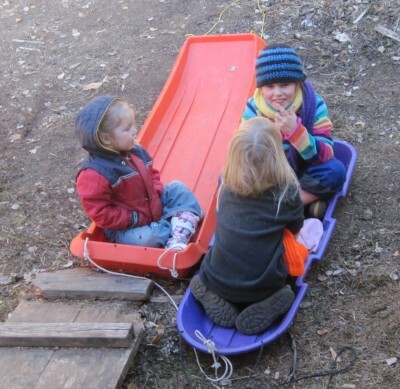 We have a big orange sled, a smaller purple sled and a dish-like red sled. They are all tied together. 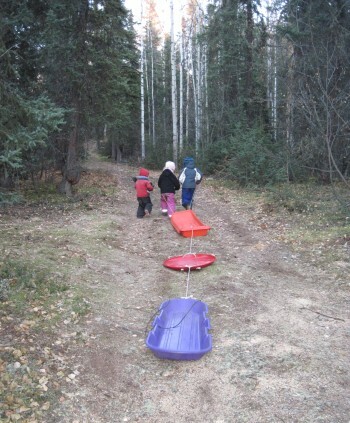 Robin in the big orange one, Cheyenne in the red dish and Jasmine brings up the rear in the purple sled. After the first couple of yards, there is a steeper part. That's where the real speed is picked up. As long as Amarins can run faster then the sleds the speed can be maintained and they sled all the way to the cabin. Bill is back home from work by supper time. Left over stew and cheese scones make a fine meal for tonight. We keep recording new temperature records! 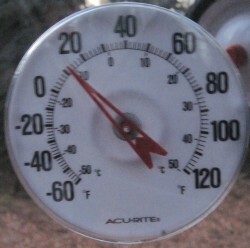 The lowest temperature recorded up till now: 19 degrees. And that is still above zero! 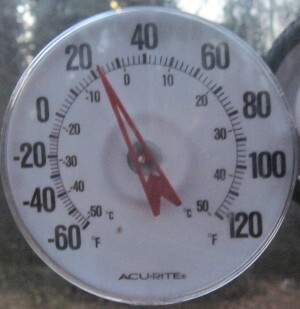 We're expecting this temperature on the opposite side of zero. And pretty soon in the future too. Yesterday Amarins took the girls into town. The first time in two and a half weeks. As we pull out of Darling Avenue, and turn right onto Old Murphy Dome, we see Mount McKinley on the horizon. It's as clear as a bell. We only now realize that from within a mile of our cabin we can see Mount McKinley. Wow. We don't miss a bit of all the hustle and bustle in town. Yesterday we came for pleasure only. First to Gulliver's bookstore. We picked up a dictionary for Jasmine. One with many pictures. Her first dictionary. Bill brought another dictionary home for Cheyenne the other day. She's been reading a lot of entries already. One of them the "guillotine". After reading aloud to Jasmine, Jasmine has no desire to go to France anymore! After a brief visit to Gulliver's Bookstore - though we're tempted to stay much longer - we head further up the road. On to the library. That's our main goal in town. We have 22 books to return. The girls have been busy. We still have several books at home. Mainly the ones about drawing and the ones Amarins checked out. The girls are excited about the visit. They feel right at home at the library. In Mount Vernon, Kentucky, we went every week to the story hour. Fond memories. And we're making fond memories here. 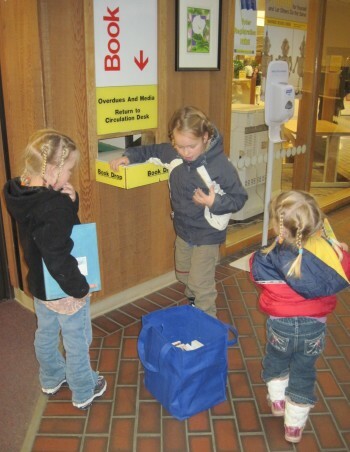 The girls run straight to the conveyor belt where they get to return the books on. Lots of fun in just returning books. Who would have thought? Cheyenne is on a quest to find the missing "Magic Tree House" books. 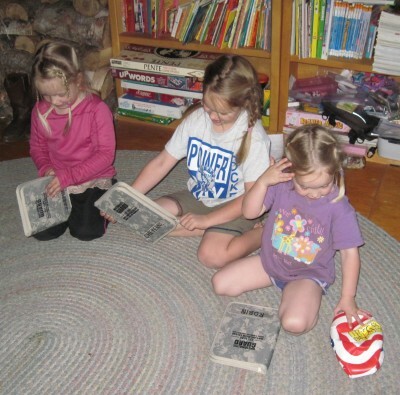 She reads them in order and has a nice collection already at the cabin. Now she needs to find the missing ones to understand the entire story. Jasmine is eager to find books for herself. At the beginners section she discovers a series just right for her: "Fancy Nancy". Perfect for Jasmine. All about frills. She quickly fills up a basket wit the entire series. Robin mostly absorbs what is going on around her. She picks out some books. 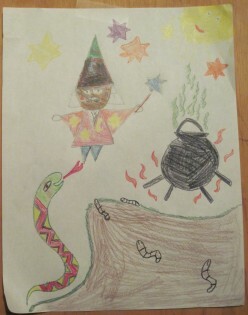 She likes the hard paged ones with pretty colorful pictures best. Especially when they have a "lift the flap". She doesn't go overboard like Jasmine does and keeps it to about a handful of books. After three hours of looking, reading and playing on the computer, we make it to the check-out with two baskets filled up. Sixty-one new books to read. We're going to be busy! 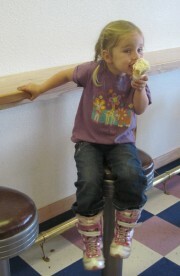 After a great afternoon at the library it's time for icecream! We know exaclty where to go. Hot Licks at the Geist/Chena Pump area. They are staying open all winter long. Ice cream in the winter sounds silly, but perhaps it actually tastes warm when it is minus 30 outside. We head back up the mountain with the sun on our side. Going up Spinach Creek it clearly shows us that fall has come and gone. 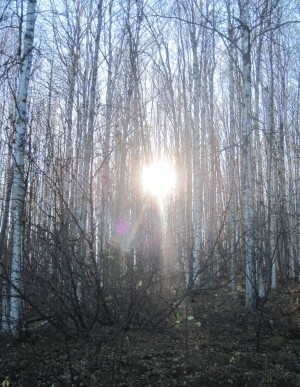 The sun between the birch trees. At the top of Spinach Creek, where it meets Old Murphy Dome, we take a break at the overview. What a sight. We can even see our neighbors from here! Direction: North-north-east. Our cabin is in the vicinity of the red speck on the map. We are glad when we pull into our humpty bumpy drive way. It is home for now. 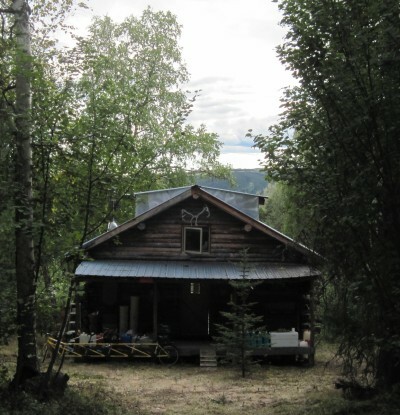 We are very fortunate to have found this beautiful rustic oh-so Alaskan cabin in the woods. Thanks for letting us stay Dave! Inside the wood stove still has coals and quickly perks up again. Outside it's not too cold. The wind has died down a bit. What a difference that makes! It is 6am. 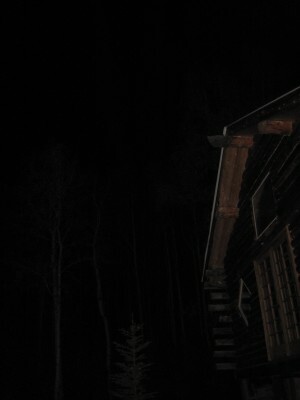 What looks like the first snow flurries of the season, can not be detected once the flash light is turned on. They must be the water particles in the air, clogging up the lens. What to do when you're up so early? First you perk up the fire. Next you start breakfast; hot butter buns today. And since Amarins messes up with the yeast; putting it in the wrong measuring cup, but with the right temperature of water; suddenly you are also working on a loaf of whole wheat bread. Juggling the two is a bit more complicated then just dealing with one recipe. Temperatures are different and so are the waiting times for the rising. But miraculously (or just with good effort) both turn out all right. The sounds in the kitchen and the smell of baked goods, wake up the girls; one after the other comes down the stairs. 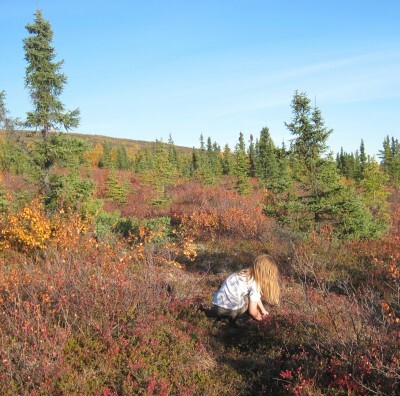 After breakfast we decide it is a good day to go berry picking on the tundra. We call David and Norma and they are willing to join us. We'll get together after a (well-needed) nap in the mid afternoon. But first Amarins needs to do some sewing. Jasmine doesn't like the color of her (very warm) winter jacket. With a couple of colorful beads, the jacket is decorated enough for her to wear it outside. We are driving to the same spot where we went blue berry picking two weeks ago. 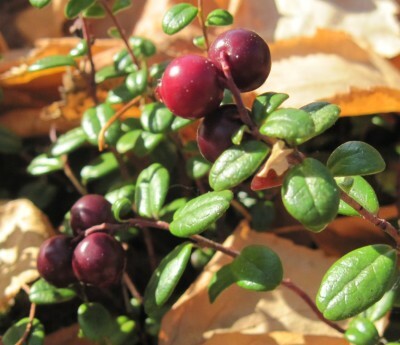 This time we are going for the low-bush cranberry (Lingenberry). Jasmine is dressed for the tundra. 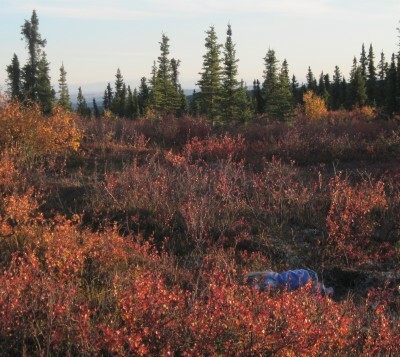 Is the tundra ready for Jasmine? Yes, ready with plenty of blue berries! 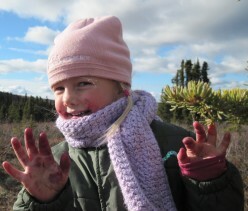 Jasmine enjoys the berries of the tundra. 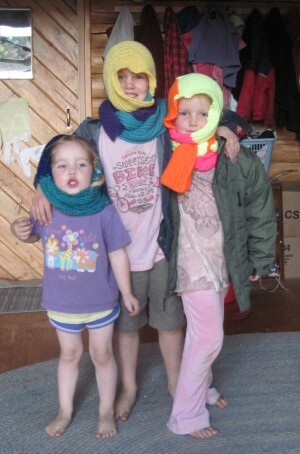 We are glad we put the girls in their ski-bibs, winter jackets, hats, gloves and scarves. 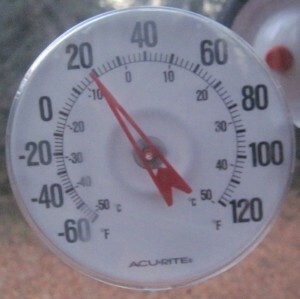 The wind is brisk and makes it very cold. There is no reprieve from the wind. No trees to shield behind. Norma and Dav are already picking as we arrive. Norma especially is a pro. 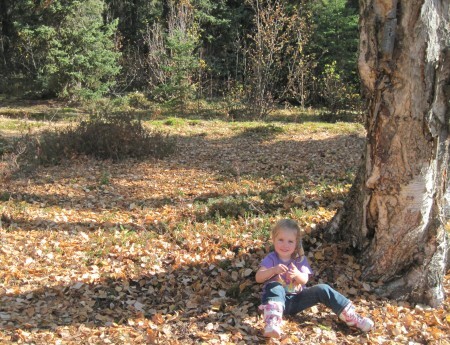 She grew up on the west coast of Alaska, a native of Scammon Bay. 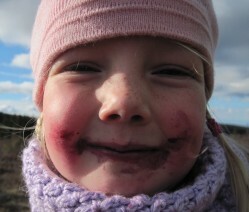 Berry picking is ingrained in her culture. It is a pleasure to work alongside her, listening to her stories of her family, looking at her hands professionaly picking and picking. The girls are just enjoying being there. Cheyenne quickly takes charge of the hot tea area. A natural dip in the terrain provides some shelter from the wind. It doesn't take long and the men join the area. The girls know where to snuggle up to stay warm. Amarins and Norma keep on picking. It doesn't take long though or Amarins' fingers are very cold. More and more breaks are needed to warm them back up. Not for Norma though. As David puts it so eloquently: "She's no cheap Eskimo!" After almost an hour and a half we call it quits. Maybe half a paint bucket full, four cups perhaps. This time on the tundra cannot be measured in quantity. Only in quality time spend with friends in nature. 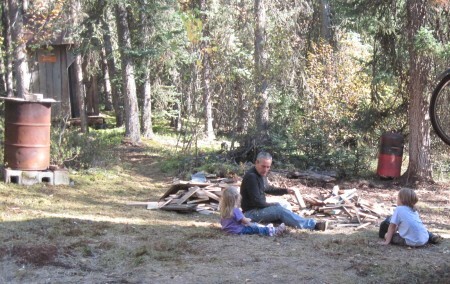 At the cabin we warm up in front of the fire. Bill takes Cheyenne and Jasmine down the road to meet some friends with the long awaited suitcases; suitcase Bill brought with him from Tennessee when he went to visit in early August. They have finally arrived! Now let's see what's in them. The girls are eagarly waiting to receive their nametags. The tags go on top of the notebooks that are in the suitcase. Cheyenne is carefully putting her things away. After the unwrapping of the suitcases, another surprise awaits us. The first snowflurries of the year have arrived! It last long enough for all of us to see them, but then the moment is over. The cloud moves away without leaving us with a thick cover. We'll have to wait for that another day. Snow is in the air! We're loving it! The snow clouds are moving on. Another week of odd jobs for Bill. He's taking them while he can and the weather is still good. That is a matter of perspective though. In Kentucky hardly anyone would be out working when it's in the 20s! Yesterday Bill went to cut wood with Wayne the Woodcutter in Salcha. Wayne has provided us with four cords of wood for the winter. In return Bill has helped Wayne cut and load wood for four days. Yesterday they cut and split over three cords together. 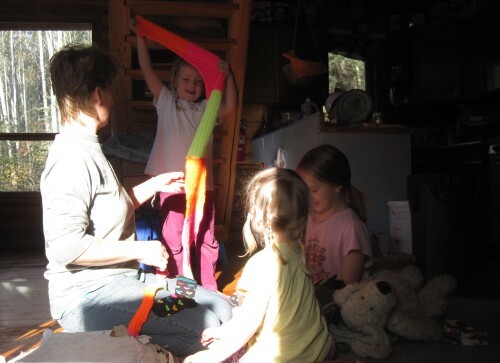 The girls and Amarins start the day with indoor activities. It's nice to wait till the sun comes around the trees. It does no longer go over the trees. Not until later in the morning do we get the sun in the cabin. The sun is just teasing us in the meantime. This morning is a morning to sort paperwork. Jasmine has set her mind on sewing a t-shirt for Robin. Jasmine and Cheyenne are sorting out the adresses of our supporters by state. Jasmine is pedaling away. She's sewing a t-shirt for Robin. The t-shirt is ready! Jasmine is proud, Robin is excited. 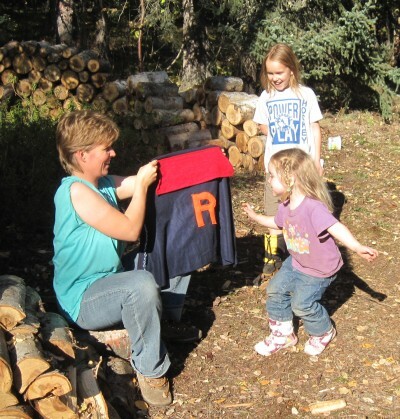 It doesn't get out of the 20s, but when Mom says she'll pull them down the hill in the sleds, the girls quickly get dressed. All of a sudden there is a flurry of great team work going on. There are no questions asked on who is going to pull the sleds up the drive way. This time Cheyenne and Jasmine are pulling together. Up goes the sled train. At the top of the drive-way. It is after supper. The sun has already set on the horizon, leaving us with a pinkish glow. The wind has vanished. 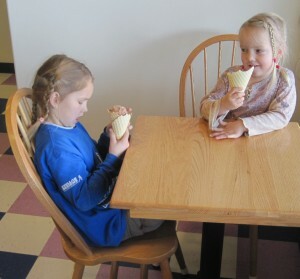 Not a sound in the air, except for the girls' laughter and chitter chatter. Ready to go. Now all they have to do is yell at the sled dog (read: Mom) to hook up and start running. 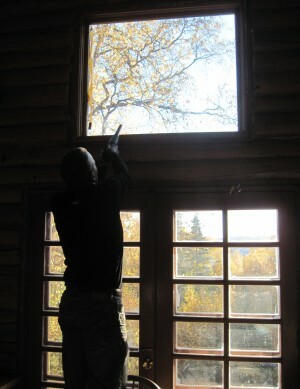 Today is redecorate-the-cabin-day! It is time to figure out a way for Jasmine to have her own personal desk, so she can have her private space. Cheyenne's had a desk from the beginning, for Robin we've found a little cubicle, just her size. 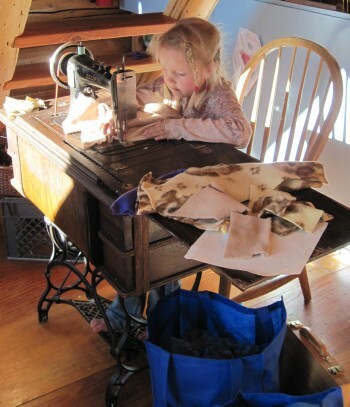 Jasmine has been working at the sewing machine, using it as her desk while it's in its cage. But it just isn't the same. Thus to day is the day! We're starting the day at 12 degrees! Bill has come out of the woods with the first part of the decor of the bus! After a day in the woods with Wayne the Woodcutter from Salcha, Bill came home with the baby birch trees for the bunk beds in the bus! 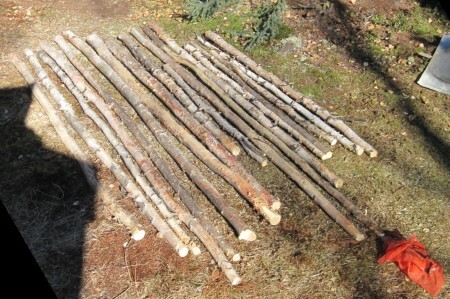 The saplings for the bunk beds. 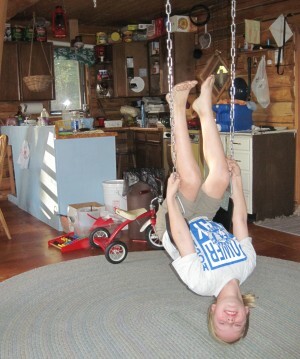 The girls are enjoying the swing while Amarins roams around the cabin to see what she can find for Jasmine's desk. It is lovely to be outdoors. 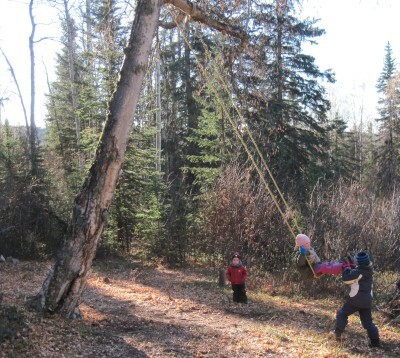 The sun is warm, there is no wind, the girls are pushing each other on the swing. Life is good. The temperature does not deter the girls. They know where there warm winter gear is. Get dressed and go outside to enjoy the swing. 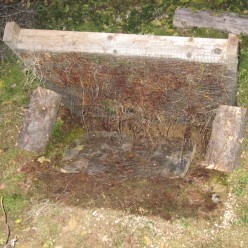 With hands full of boards, a couple of concrete blocks, some flowerpots (both red stone and wooden). Now it is time to see how we can all fit them together to make it both esthetically acceptable and above all functional. We pull everything out of the corner, where we are going to put an extra bookshelve unit. We clear everything away from the French doors, where Jasmine's desk will be. Now we can get to work. We're fitting the pieces. discard what we don't like and end up with a corner bookshelf sitting on top of two concrete blocks. Jasmine has a long board as desk, sitting on top of two crates with each a wooden flower pot to increase the height. Of the stone flower pot we're using only one. It's perfect for the legos. Yes, we're happy with the remodeling. And Jasmine is happiest of all. Finally a desk for Jasmine! The day has passed quickly with all the moving around of furniture and would-be furniture. Before we know it it is supper time. We're having fresh Alaskan potatoes with (not fresh) green beans and apple sauce. For dessert Robin helps Amarins make peach scones. We make some extra so Bill can take some to work tomorrow. Robin is cutting the butter for the scones. Robin loves reading time with Daddy. Bill stopped by the transfer station today and look at what he found! A complete encyclopedia! That'll be great to look at (in) this winter! The girls are in bed early. We have time together. It is fun working together on a new project. The winter has taken a temporary (as we shall say) leave of absence. We're having a heat wave! It was 25 degrees this morning! No snow as we'd expected through the weather forecast. Too bad. We eagerly looked out the window to see what we could find. Well, we'll awake to it on an other morning, we're sure of that. It is strange this jump in temperature. It is still freezing, but we don't feel it. It just feels warm. It is interesting to see and feel how quicly one can adjust to different temperatures and circumstances (in a broader realm). We live in Kentucky, with all its seasons. We ride our bicycle cross country, and endure all seasons to the extreme. 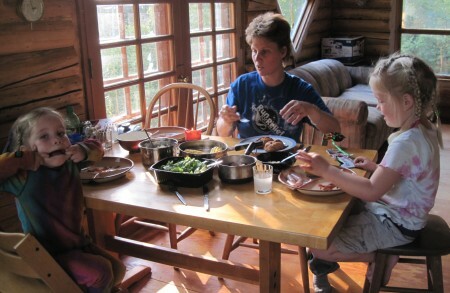 Now here we are in a cabin in the interior of Alaska, awaiting the strongest winter any of us has ever experienced. The weird part is, we're ready for it. Or perhaps it's not weird. It's just who we are. We accept change with open arms. As the saying goes: "Change is the only constant factor in life." We don't wait for life to change the situation. We change the situation and live life full out. Robin gets to go potty on the little one, inside the cabin. 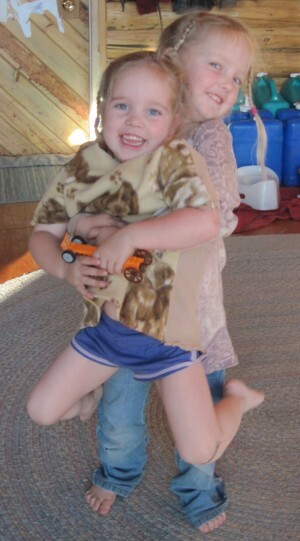 Cheyenne and Jasmine have to go through the dress up part to go outside to the outhouse. Today, they just stick with their shorts and t-shirt. Only randomly throwing on a jacket. They are some tough girls. Breakfast depends on what baked goods we have available. If there ar none, we whip up some hotcakes, nibble some cereal, start with an apple, boil an egg, perhaps even bake some bacon. Today is a hotcake day. The rotating of the sourdough starter is going great. All three starters (The Alaskan 1900s, the Pedouin, and Jennie's) are still alive and are doing well. Today it's Jennie's turn. This sourdough starter is great for hotcakes as well for different kinds of breads. The Pedouin starter is still in the young stage; great for hotcakes. The AK1900s can be used for anything. It never seems to fail. And the girls are always asking for more. 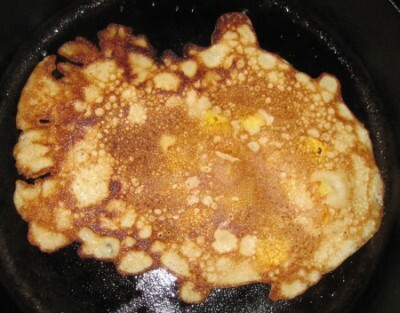 This hotcake looks like a fish! The workbooks are a bit on the back burner. It is knitting, beading (or a combination), clipping and pasting that's in fashion today. A book full of famous American women is being disected. With scissors! Every woman needs to be cut out. Tedious work, but doable. Amarins pitches in sporadically, but overall it is Jasmine with help of Cheyenne who does the brunt of the work. Jasmine and Cheyenne are clipping out the images of import women in America. Each comes with an extra outfit. Especially Jasmine loves it. We try to find some of them in the encyclopedia. After Robins nap, it is time for a walk to the end of Darling Avenue. A neighbor (9 miles away, but still considered neighbor) has come over to visit with her seven children, a friend and her two kids. Talk about a cabin full. It doesn't take long to bonjour every one out the door and up the hill. Twelve kids running wild, riding bikes and rolling along on a skate board. It's a good thing Darling Avenue is not a much travelled road. We're all over it. Out for a walk/bike ride, on Darling Avenue. Robin almost rides the wheels off the tricycle. She pedals it to the end and back again. At the end of Darling. A performance from Hamlet awaits us. Rolling down the hill by bike or skate-board is great fun. The weather is so nice. It warms up to the mid 30s, the sun shines weakly through the clouds. There is no wind. No hats, scarves or mittens are needed. Especially not with all the running that goes on. A good way to experience some fresh air, while it's not too fresh yet. After supper it is time for a bath. The bath tub hangs on the covered porch. Before use we put it in front of the wood stove. Next we place it near the wood stove and put a couple of pieces of wood under it, to tilt the tub, creating more water in one end. 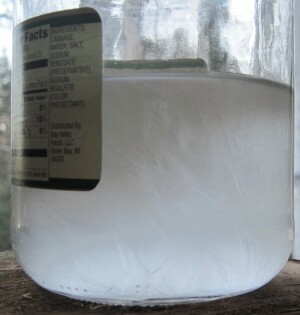 The water has been warming up on the wood stove. It's waiting to be used. The kettle and a big pan, add some cold water and the bath is ready. Another pan awaits for later use and as rinsing water. It's very basic and simple, but it works well! Bath time! Nice and warm in front of the wood stove. Warming up in front of the wood stove. It's a late nighter tonight. It's much easier doing it on this regular schedule, versus when we had to catch up for a week on end during our time on the road. Now it takes about two hours per web-evening. The fun of doing it in the evening is, that when the East Coast wakes up, it's there waiting for them. We're lagging four hours here in Alaska; ten in relationship to the Netherlands. This way every one can get a fresh doze of Pedouin news about every other morning. Good morning every one! I'm going to bed now! Our plans for the winter. 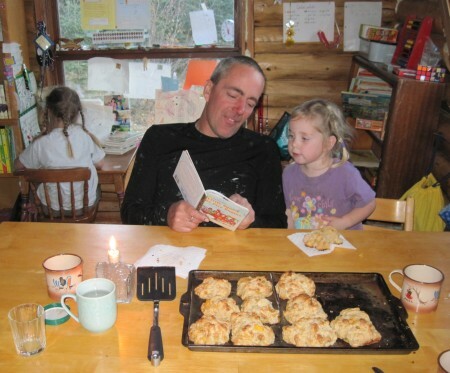 We're writing a book about our incredible bicycle journey. 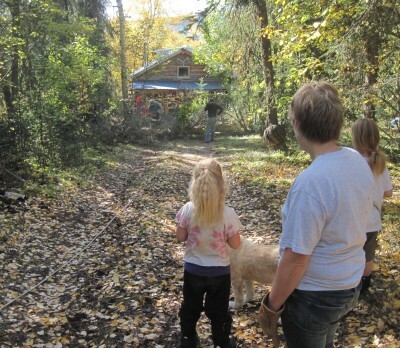 That's why we're loving the fact that we have this beautiful remote cabin in the woods. When the book is finished and the step to publishing is made, we're going to find an old schoolbus. This bus is going to be our way of transportation. Transportation to every state in the continental US. We're designing our own book tour. Making it a journey all by itself. So our focus point for this winter is to write the book, find an old 1950s schoolbus, fix it up, and be on tour by the end of the Alaskan spring. Wherever you are in the states, we're going to stop by somewhere near! We're so excited! Our First month of Winter?